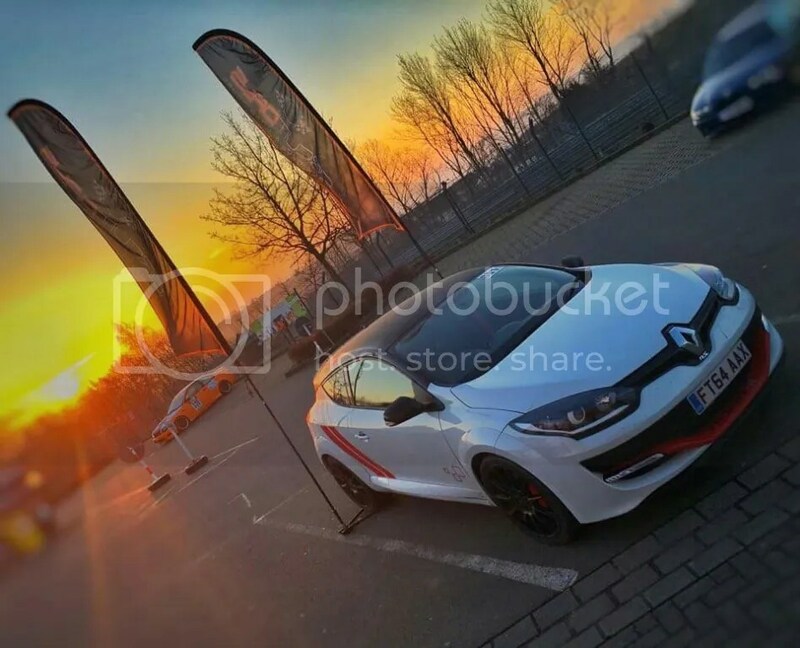 Back in December 2015 I saw Circuit Days had a trackday at the Nurburgring on Friday 8th April. 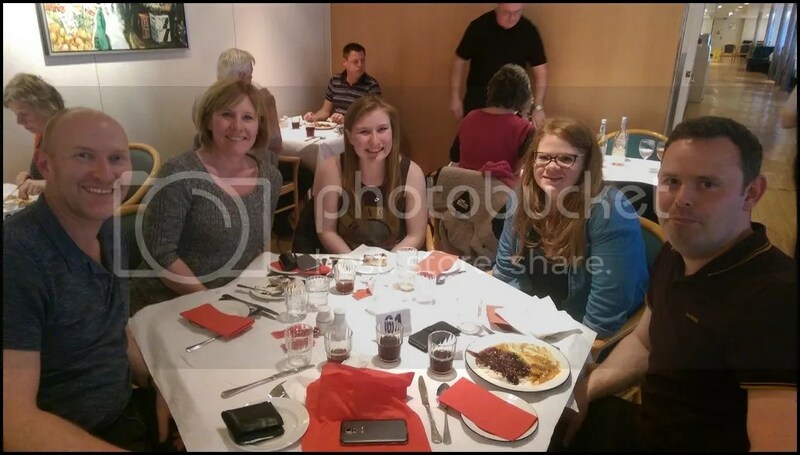 The timing worked really well as it was Easter half term so my Wife could also attend. The date was put in the diary and I started looking forward to it. 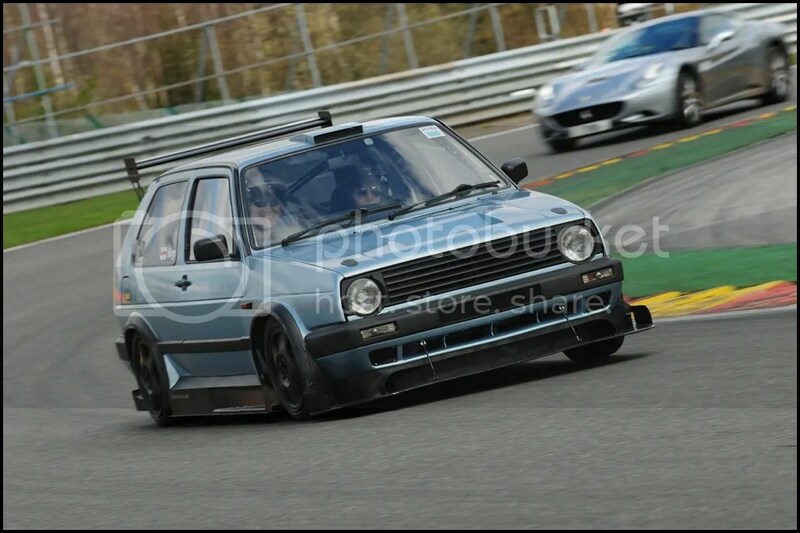 Last years trackdays always seem a distant memory in the middle of winter and being able to look forward to this not only gave me something to look forward to but it also gave me a deadline to have the winter tweaks completed on the Golf. 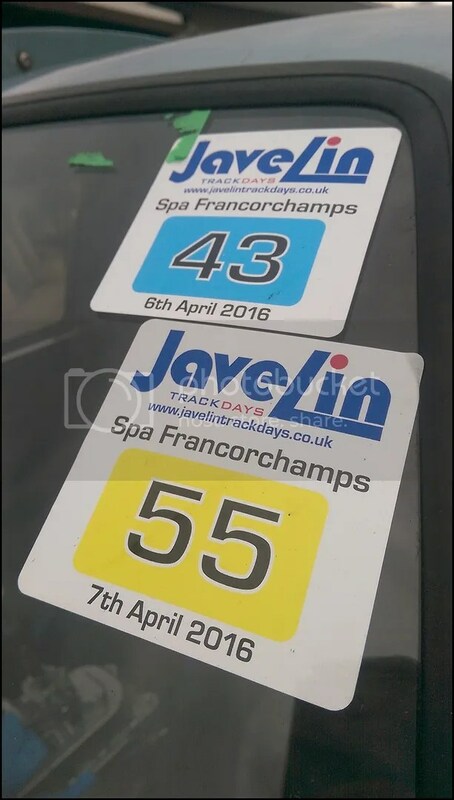 Then Javelin announced 2 days at Spa on Wednesday and Thursday the same week. 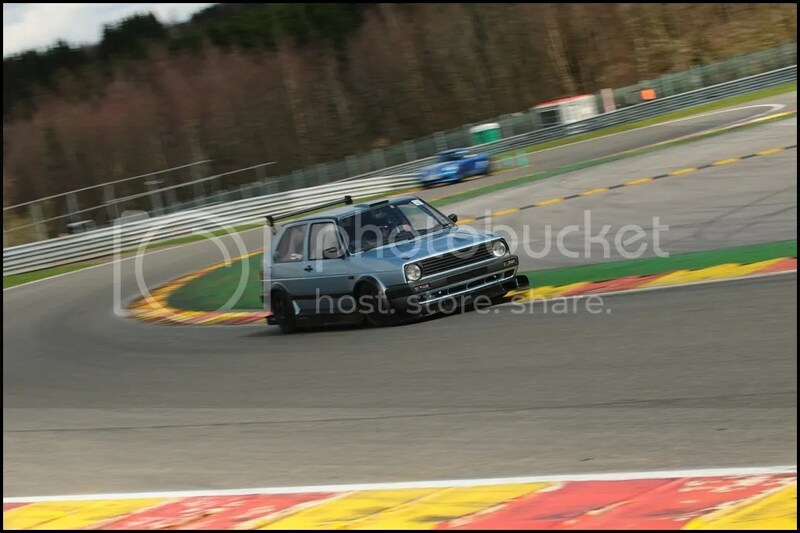 Not only is Spa my favorite circuit but it worked out even better seeing as I`d already be out there for the Nurburgring trackday ! Employing the well used `man maths` technique of track cost justification I explained to Lou that we would be out there for the Nurburgring trackday anyway, so it actually made sense to book onto the Spa one as it would work out cheaper than going across just for a day at Spa. 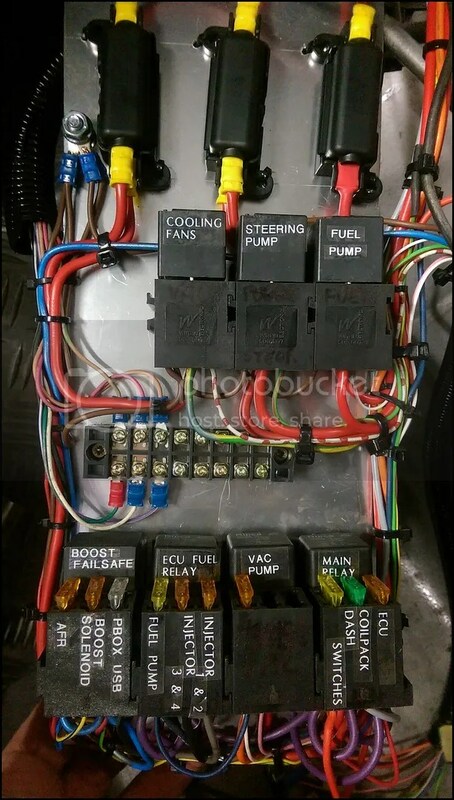 Car prep went really well, I`d had an electrical issue at Donington so bit the bullet and made a completely new ECU loom with brand new crimps on every connector and a standalone fuse / relay board. 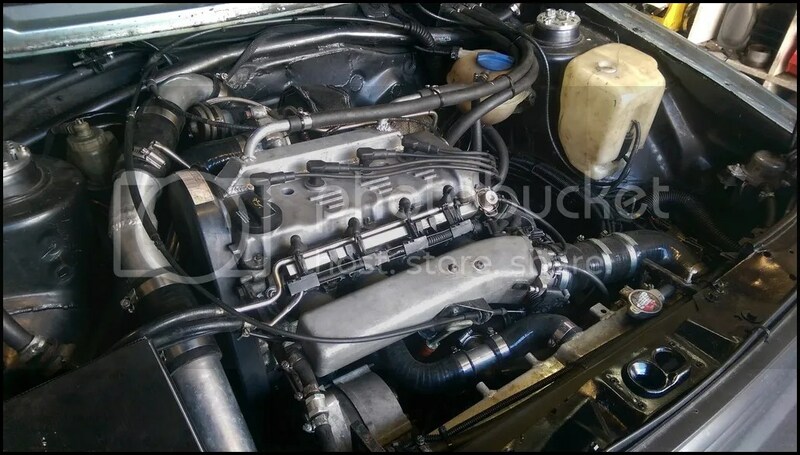 Engine bay was the tidiest I can realistically get it and even if I had another week to prepare, I wouldn`t have done much more. 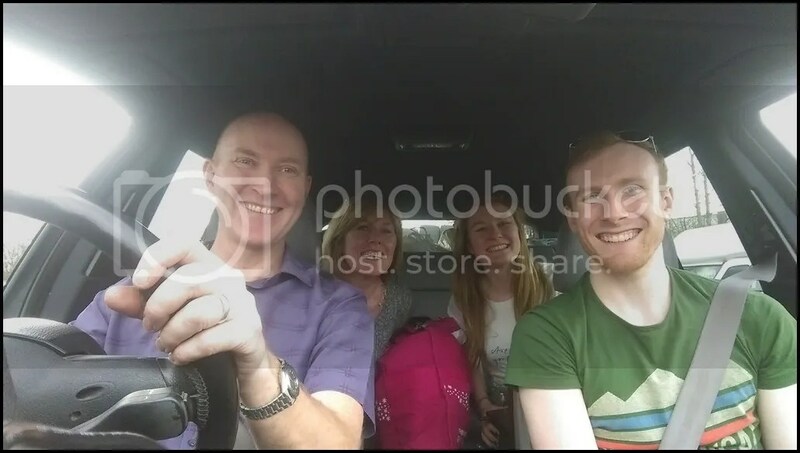 Car loaded up with several days to spare and I left home full of confidence in the car and excitement about the upcoming trip. Journey over and Spa. Day 1. Left home on Monday afternoon for a steady drive to Hull. 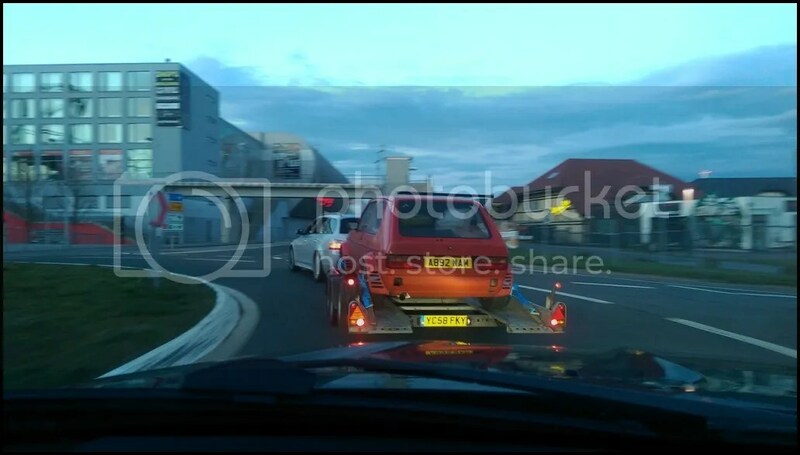 Whilst waiting to board I met up with Stu in the Atom, Tim & Dickie in the Revolution Mark in the Exige and Ed was towing his E30 M3. 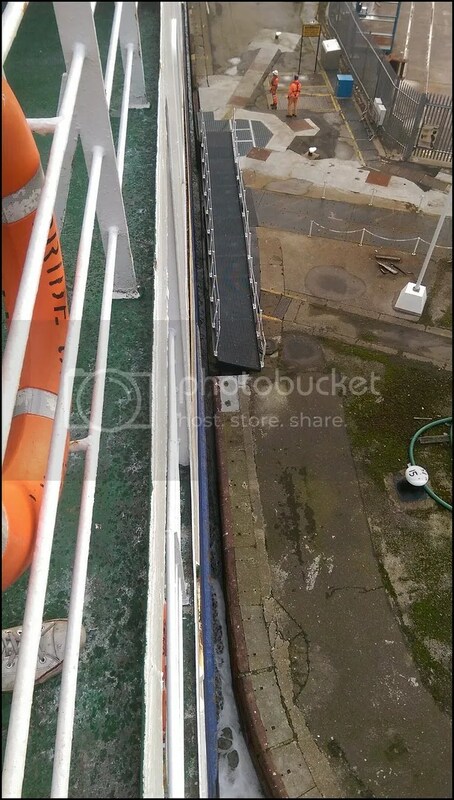 Ended up near the front which should help a rapid disembarkation. Up on deck as night fell for a final glance back to shore then inside for food from the buffet. 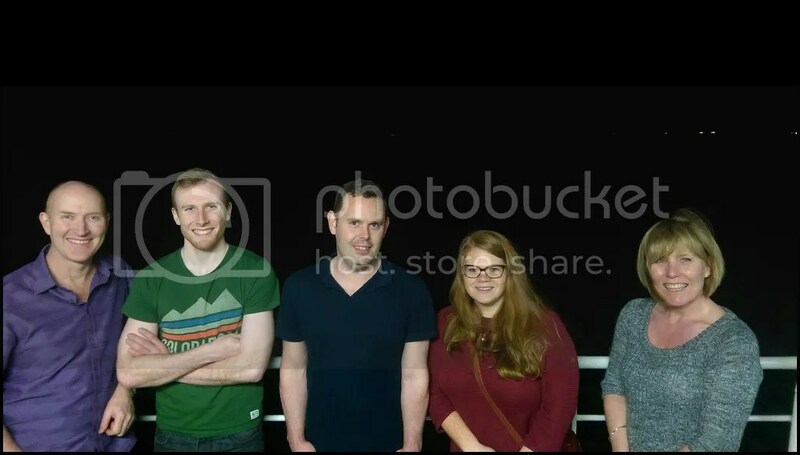 After a decent nights sleep we left the ferry after what seemed ages. From the captain saying we were on time, it was over half an hour later than expected before we finally left the ship. Quite why it takes so long when they do it day in day out is a bit of a mystery if I`m honest. 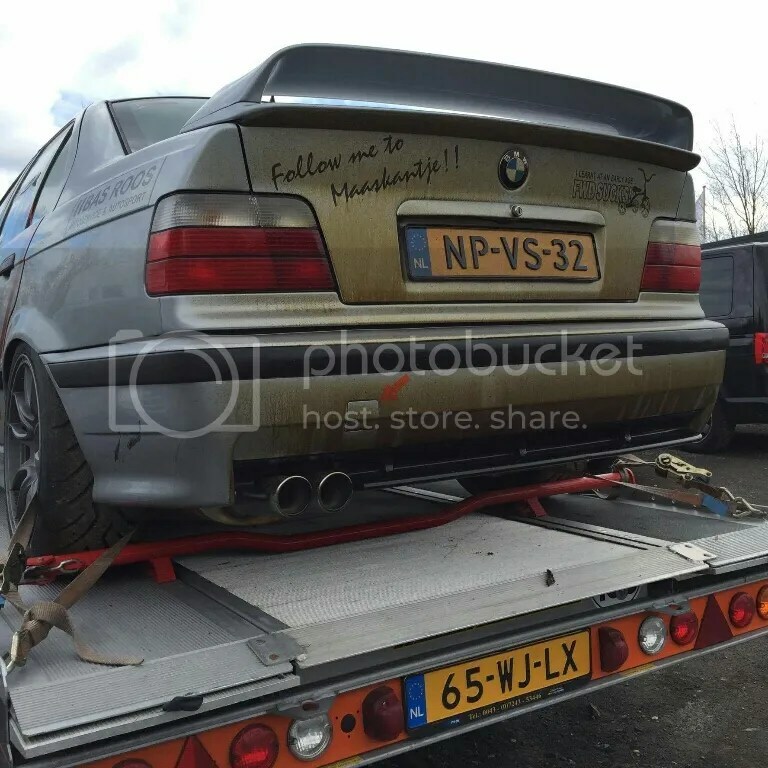 The plan was to follow Ed across Belgium to Spa. That lasted about half a mile before we were separated. 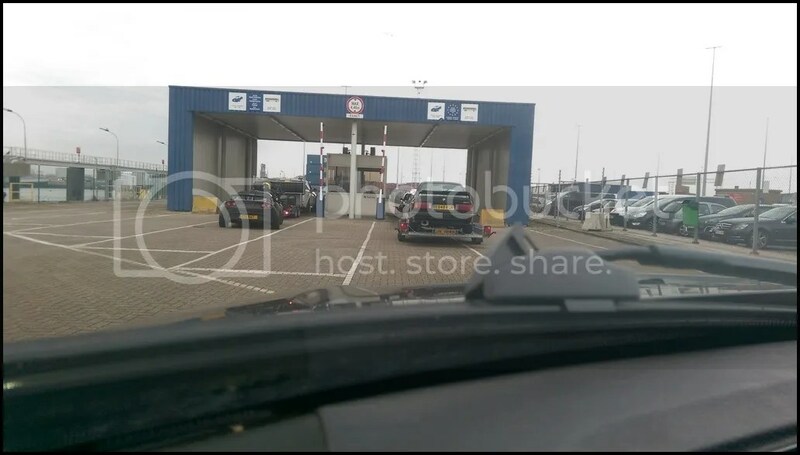 Steady drive across Belgium, although the SatNav took us an `interesting` way. 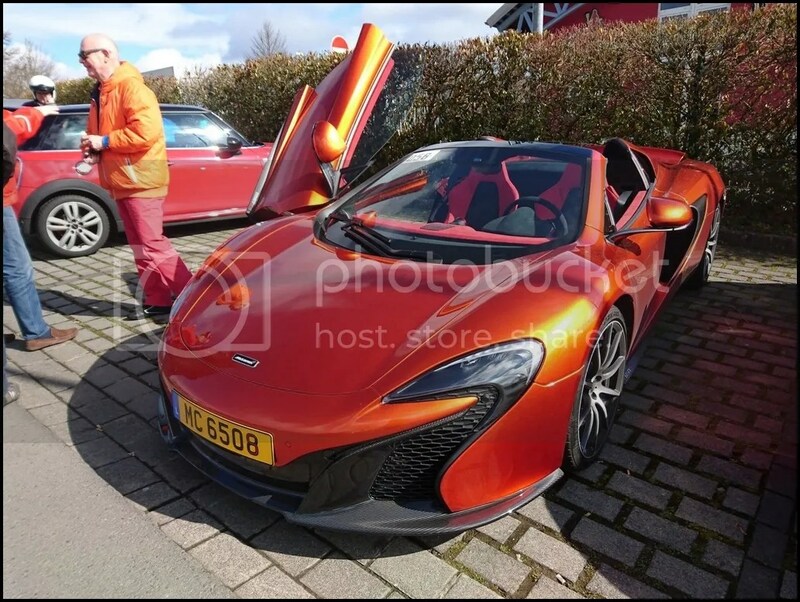 Arrived at Spa to see there was a Pure McLaren trackday on. Stood and watched for a while but it was cold and wet so we didn`t hang about. They did look rather nice though. 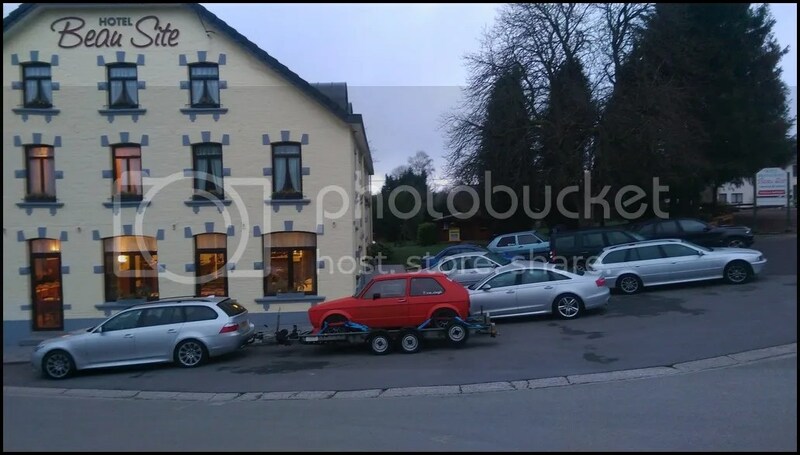 We`d booked in at Hotel Beau Site which is around 10 minutes away from Spa. The carpark was full of Brits there for the trackday. 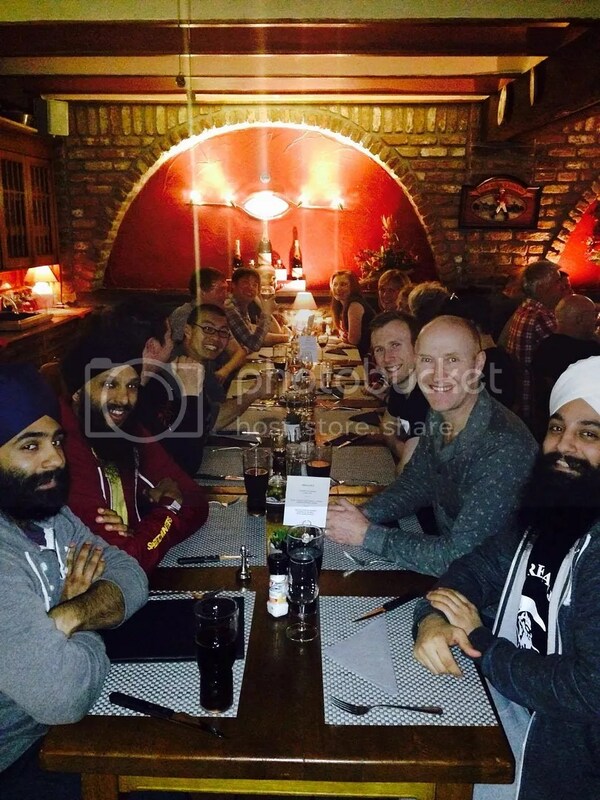 Met up for a meal, food and great conversation with friends. As usual, I only drank coke. No need for a hangover and I was buzzing enough without the need for alcohol anyway ! We weren`t out too late as everyone had been travelling most of the day and knew we had a long day ahead so it was around 22:30 when we called it a night. Arrived and started unloading the trailer. Around now, the butterflies in my stomach are doing somersaults. 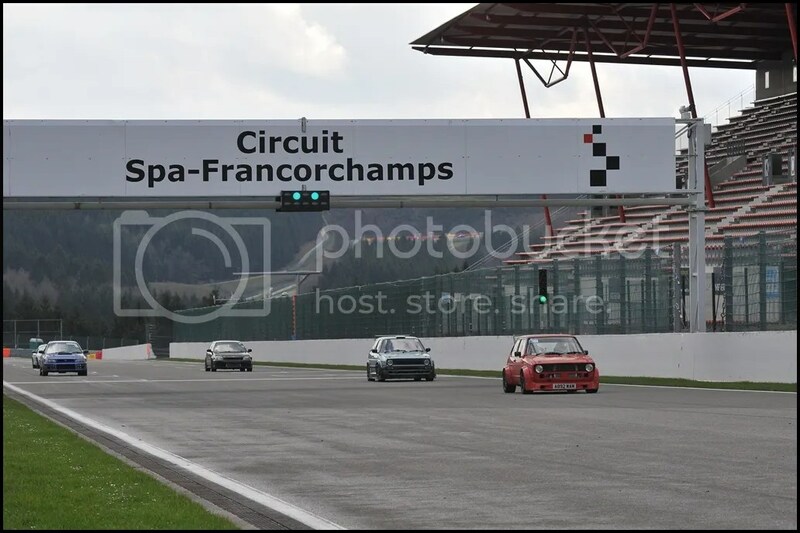 It`s odd seeing I`ve done 100`s of trackdays and many thousands of laps on track but I STILL get apprehensive before the first session. 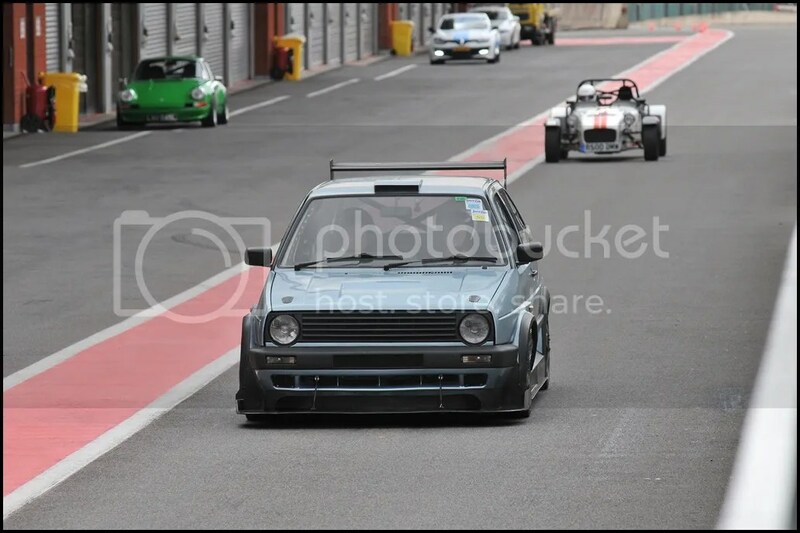 As soon as I`m out of the pits it calms down and I never have an issue again but on the drive to the track I`m terrible. Talking to other people it seems I`m not alone but to varying degrees. Matt doesn`t bother at all where Ed is similar to me. Gurds was also excited but apprehensive about the car performing for the next 3 days. I ventured out with Matt as my passenger. 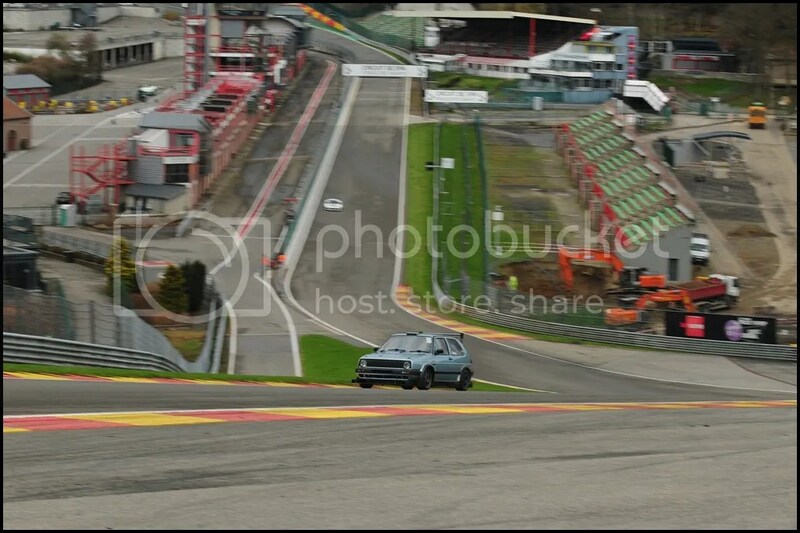 I hadn`t been to Spa for several years but the first thing I noticed was Pouhon seemed steeped than before. I just remembered it being fast and thought it was a flat corner, but the entry was steeped than I remembered. Nick was there from xtreme sports photography and Lou bought me the CD of photos. 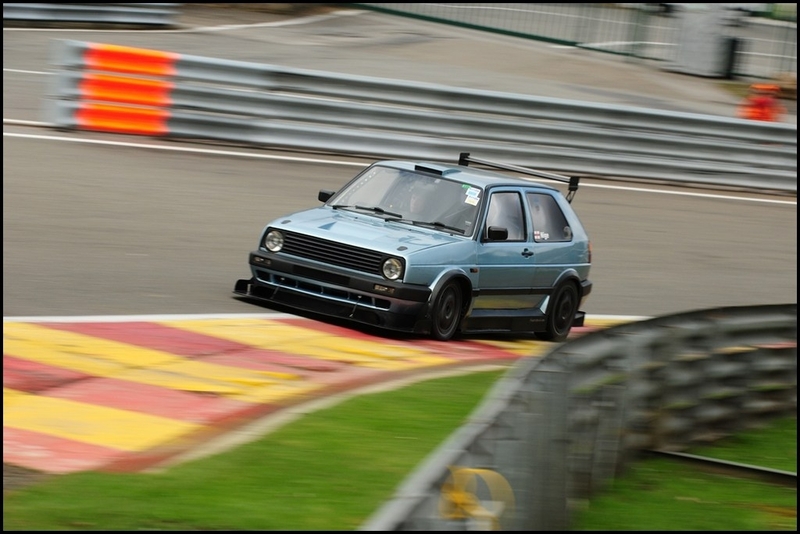 The first photo of the Golf at Spa HAS to be this one. 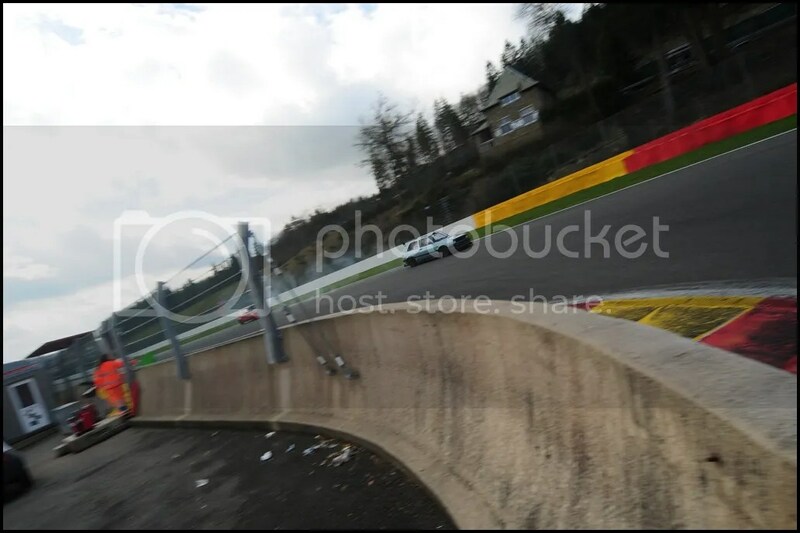 What that photo can`t convey is just how it feels to drive Eau Rouge. The speed you can carry in deceptive but the little voice in your head is reminding you just how quick you are going. I was hitting just over 130 on the Pbox before a dab of brakes and dropping to just over 100 through the dip. Everything happens quickly at those speeds and whilst it`s easy to sit here typing it now, at the time you have to concentrate and be smooth. It`s easy to tense up and I think that`s where I`m much better than several years ago. I am able to keep calm and relaxed when on track and that certainly helps me now the Golf is getting quicker. Don`t misunderstand my heart rate still goes up but not so that I`m paralysed by it. 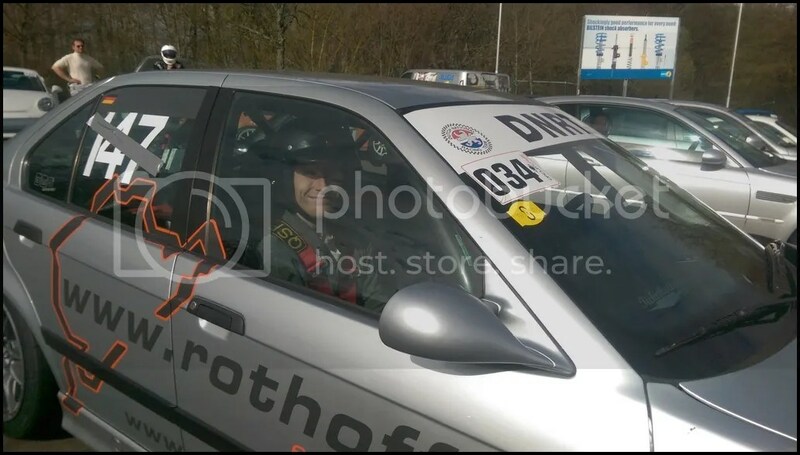 Many of my incar videos consist of me chatting most of the time as I`m relaxed and not at 10/10ths. It`s something I do without thinking although I`m trying to cut it down a bit now as I`m sure most people watching don`t want to actually listen to me. Whilst I was out getting used to the track, Cat had seen a GT4. 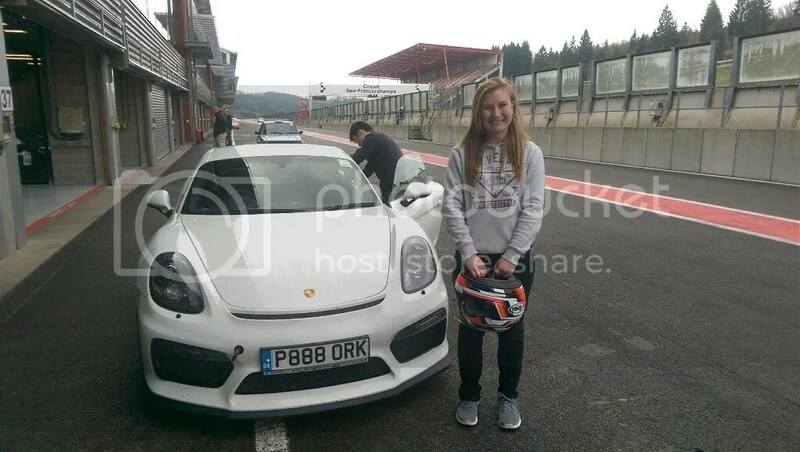 Whilst Porsches don`t bother me one way or the other, she loves them and particularly likes the GT4, in white. 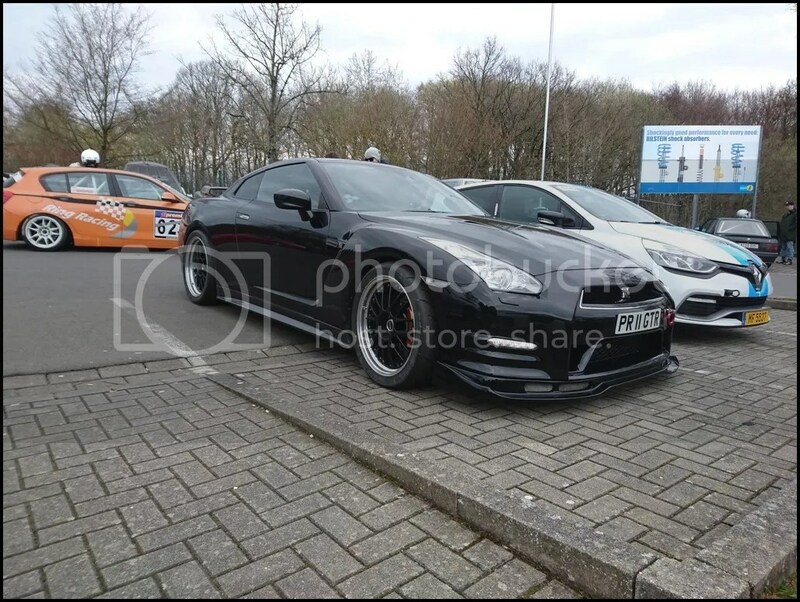 When she saw this one and was drooling Hayley said “That`s a regular driver on our events, would you like me to ask if you can have a passenger lap?” YES was the instant reply. All secured and ready to go out. She came back with a huge grin on her face and thanked Eric for the laps…. I was told this wasn`t enough kerb by a long way but it seemed enough to me ! Matt was driving here and I was quite happy with the amount of Kerb he was taking. I was certainly enjoying myself. 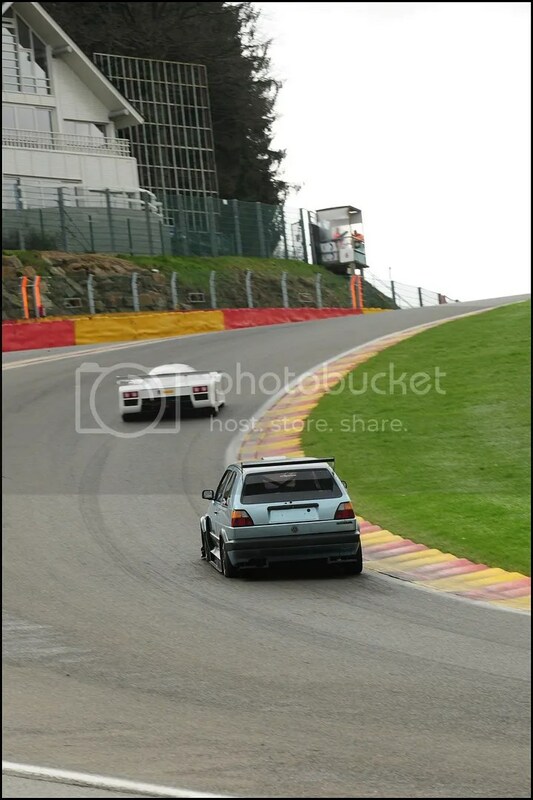 La Source is just a hairpin, but the bumps in the braking zone caught me out. 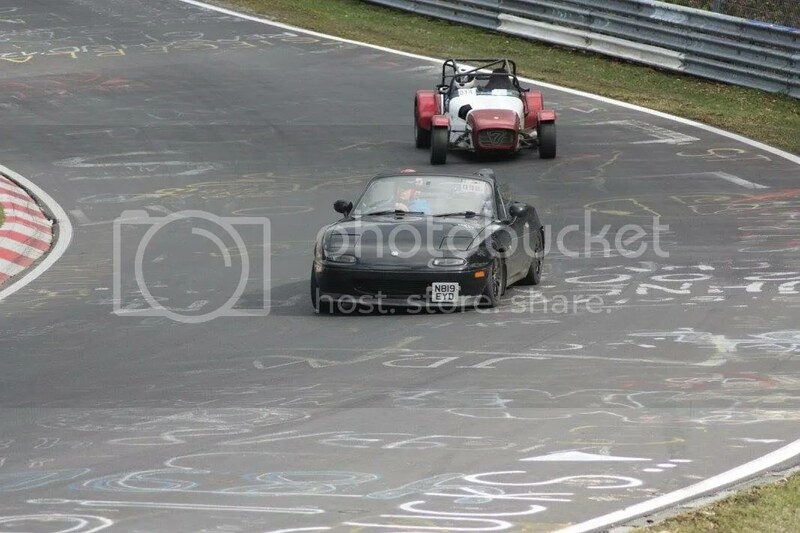 typically just as Gurds had dropped in behind me to follow and video for a few laps. Back in the pits and the first port of call was the new wiring. The car had never done it before so it had to be the wiring, right ? Well I thought so and spent some time replacing relays with spares, checking connections and testing circuits. Seemed OK so we went out again. Out with Lou next and we stopped to take this photo. Sounds fine until they reached 70mph round the circuit. Blimey, that doesn`t half feel quick. The brakes certainly got a workout. The other downside of breaking down is the tow of shame through the pitlane. Dead quick test and it was the Coilpack fuse that had blown. Very odd and I couldn`t understand why. Replaced it with a new one and it started straight up. I now understand what happened, the ECU resets were overheating the coilpack and when it happened particularly frequently it caused the fuse to blow. This never happened again but other things did which helped me understand the issue. Back out again for more laps. Saw Nick at the hairpin whilst Eric was in the car with me. Recalling the comment about “you aren`t taking enough kerb” I made sure I did this time. Eric commented that the car felt pretty communicative and compliant. That`s good, it`s what I set it up to be like ! He also commented how there seems to be a pause after each gearchange before the Turbo spools again. Not massive lag, but noticeable to him. I know he`s comparing it to far newer cars but it was something I had never even felt before.. More on this later. I enjoy learning circuits and lines but I`m not too proud to admit I can always learn from a good instructor. 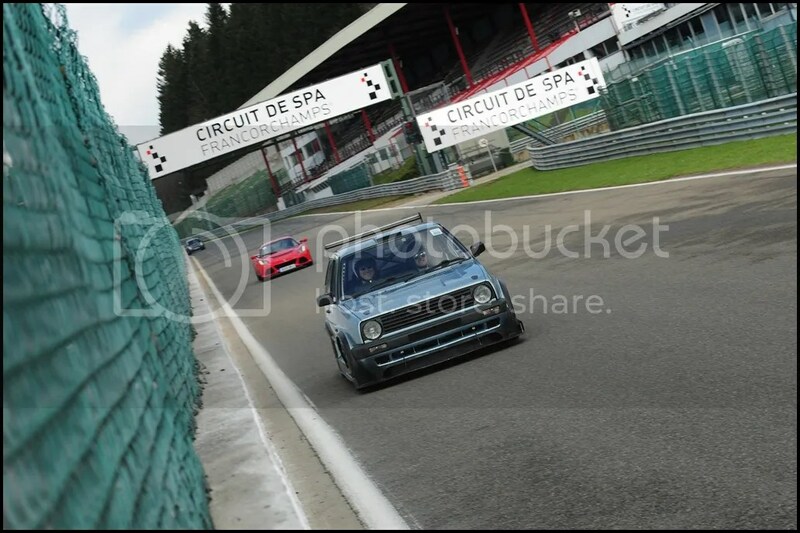 John Norrington was in attendance at Spa and he`s been out with me several times now and knows how I drive. He tailors the tuition to the driver and ability. 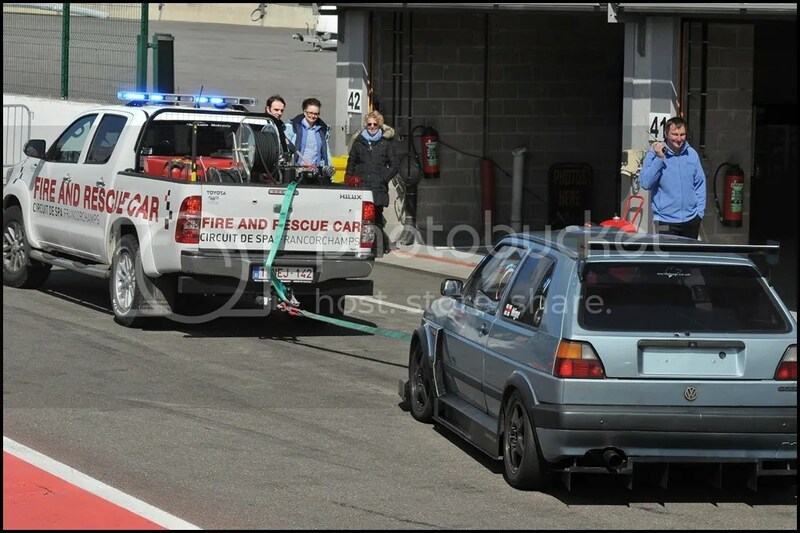 Seeing as he`s raced sucessfully at Spa numerous times it was too good an opportunity to miss. John sometimes suggests I try to trailbrake more into the corners to unsettle the rear on entry to get a better exit. 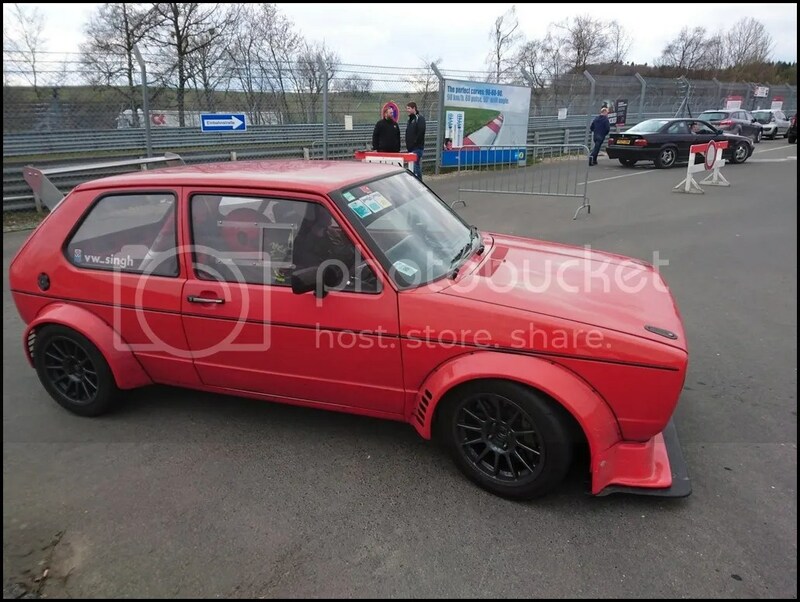 I`ve setup the Golf so that doesn`t happen easily so it`s not only counter to how I normally drive but the car isn`t setup with a loose rear either. Instead we discussed lines round various corners and as usual, I took a lot away from the session. Went out and managed around 4 laps before the temperature warning light came on. 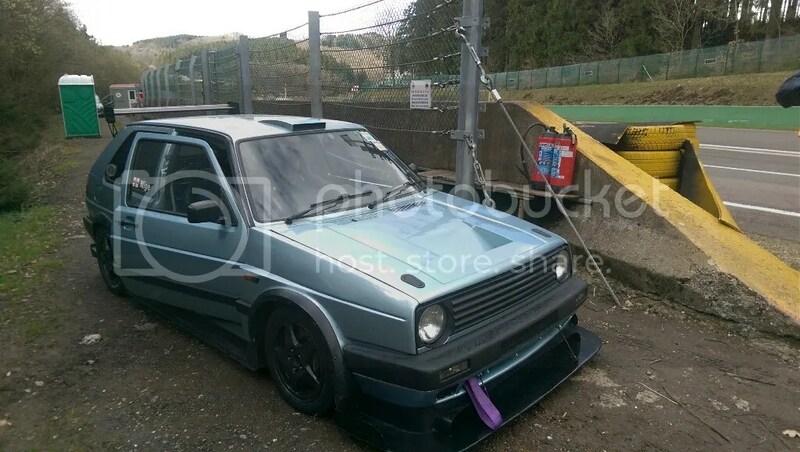 That`s very odd as the Golf NEVER overheats. I can thrash it mercilessly for 20 minutes and the oil and water temps never move. 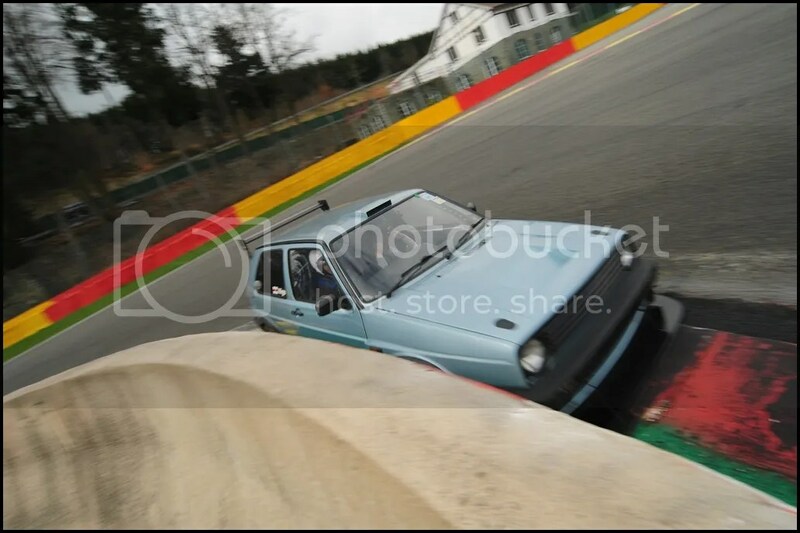 I backed off for half a lap but when it didn`t drop I pitted and started investigating. The cause was obvious pretty quickly. 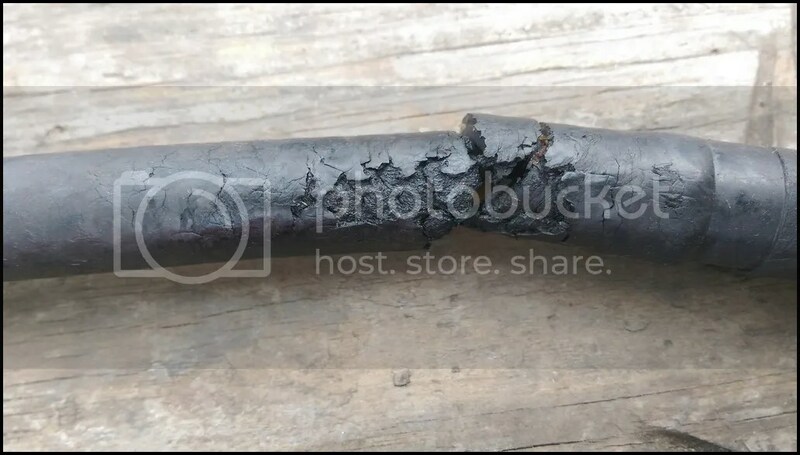 The Turbo water feed hose had burned through. This had been on 18 months and is wrapped in fibreglass tape and then aluminium coated fibreglass sheet. I carry spare hose so once it had cooled enough to get close, I replaced the hose, wrapped it and went out again. Once home I replaced it with a 10mm hard pipe so that will never happen again. Until now the pitlane had been clear. Zero queues and cars were coming and going when they chose. Basically it was pretty much perfect. Dry, not too hot but sunny and a clear Spa what more could you ask for ?? 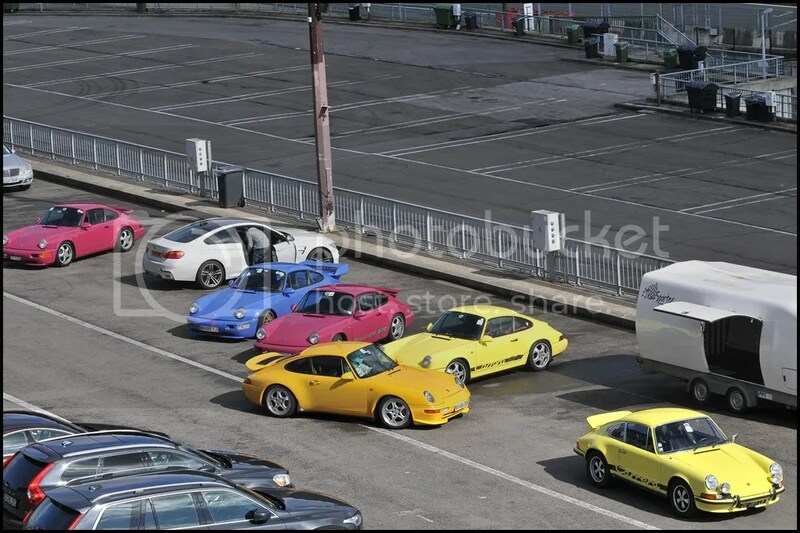 Porsches were out in force in various colours. 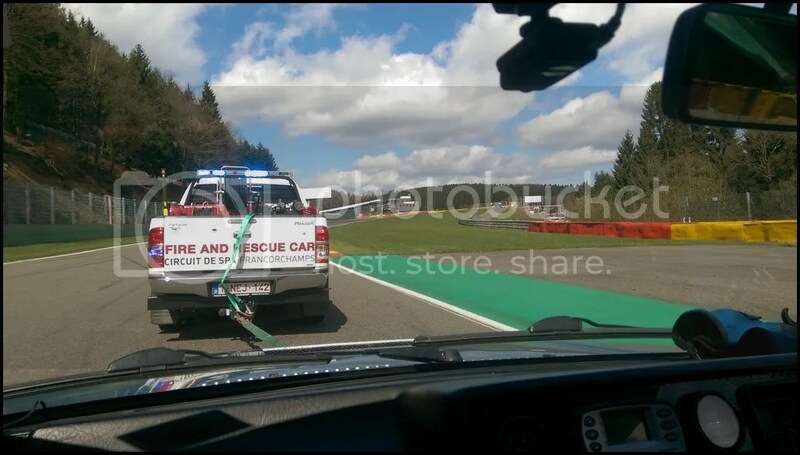 Unfortunately a car went straight on at La Source and caused a Red flag and another had an incident round the back of the circuit causing another stoppage. Out of the 2 days they were the only enforced closures the entire time ! 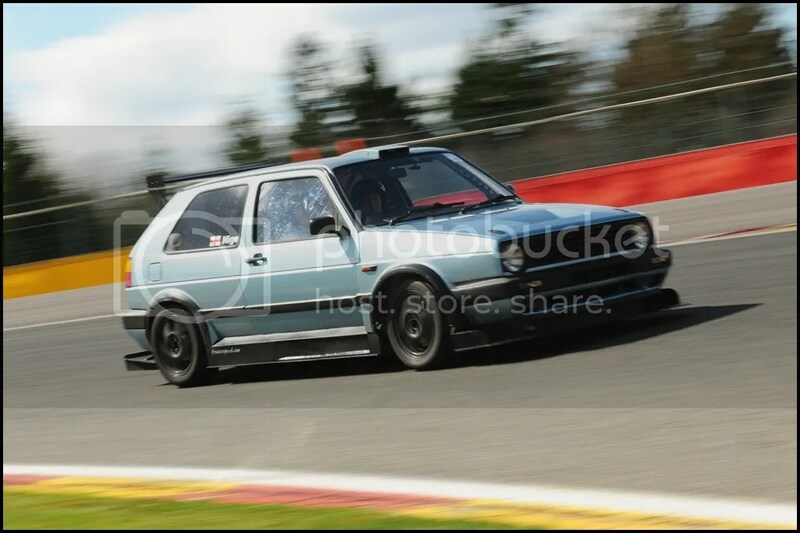 The Golf was running well and Gurds was out so we managed to get a few laps together. I`d been explaining to him how noticeable the slipstream up Kemmel was and I was able to cruise right up to the back of him with ease. 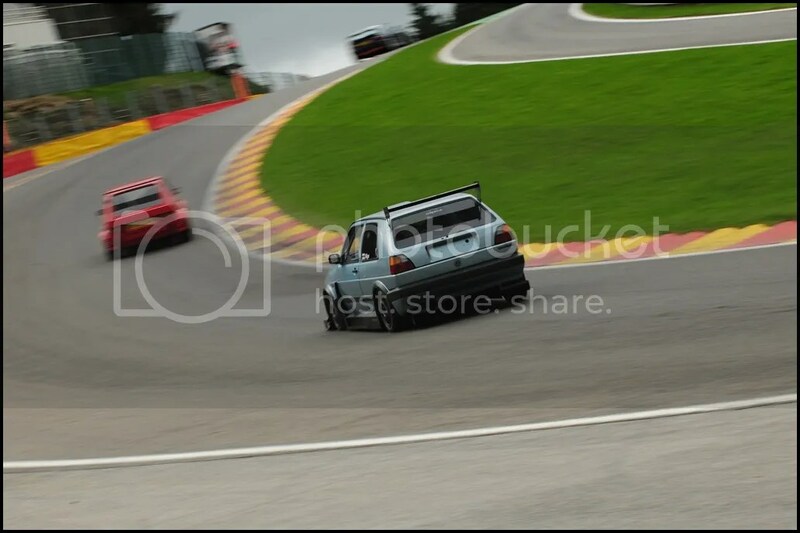 Partly due to me being able to carry more speed through Eau Rouge but also due to the slipstream. It feels odd doing well over 130, uphill on part throttle and still accelerating ! Then it started jumping out of 5th. What on Earth is going on !!?? Slow drive back to the pits, removed the wheel, drained the gearbox oil and removed the end casing. The 5th gear retaining bolt was loose so everytime I lifted the throttle, the angle of the helical cut tried winding the gear off the shaft. Why had that come loose ? At the time I had no idea, it had been on for ages with no issues.. I never knew I needed to explain that you cut the OTHER end off and keep the reducing neck when making a funnel ! 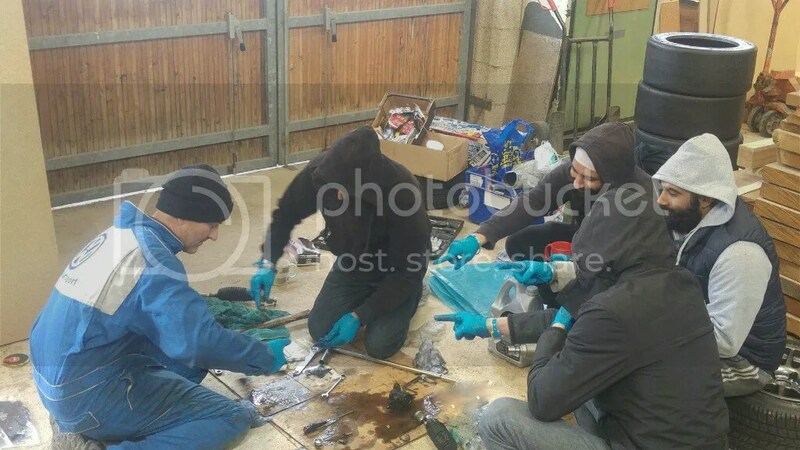 The oil was run through a fine filter, magnets stuck to the outside of the casing to catch any stray fragments and the oil put back in. 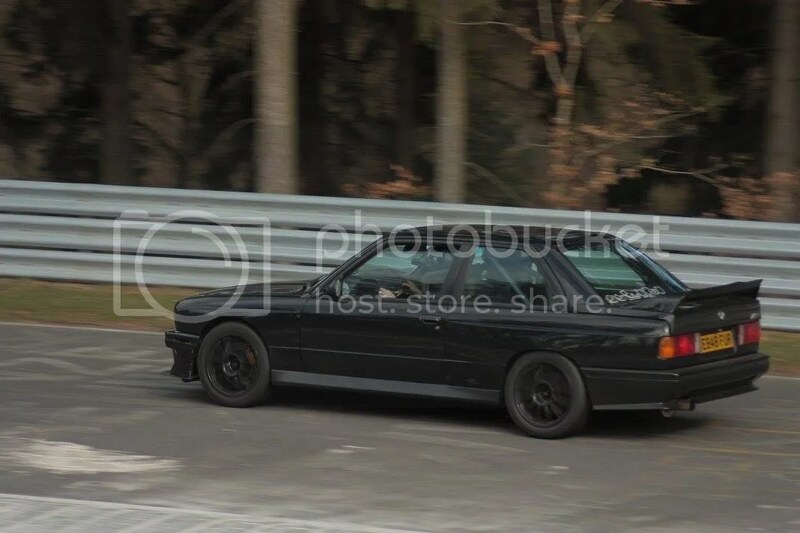 Meanwhile, Ed was lapping without issue in the M3. Gurds had a grumbling noise from the drivers side and Andy had a look to see if he could offer any suggestions. It was now getting on and I wanted to get some more laps, with the various issues I`d had it seemed like a very broken day so out we went for some more laps. Matt was happy to sit in the passenger seat until he knew the car was fine. We particularly struggled finding a good line through Rivage. 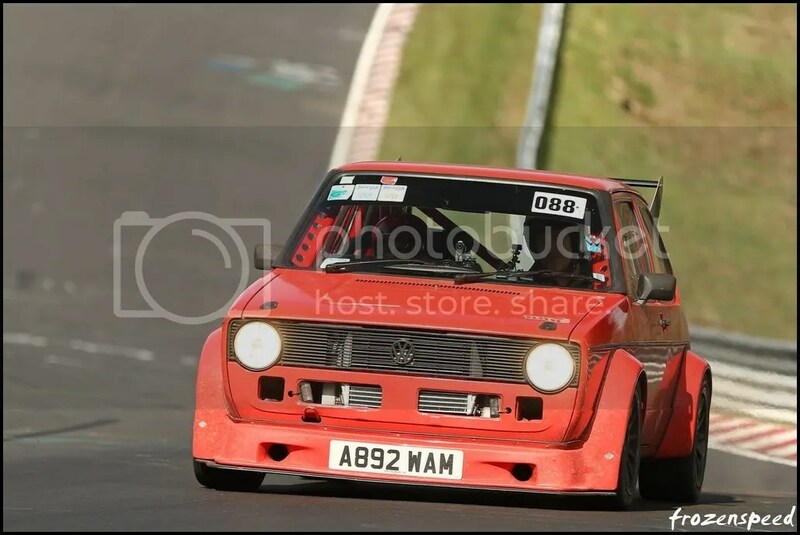 Tight was shorter but I could feel the front left taking a hammering whilst running wider on entry then cutting in to the apex felt better it was very close which was best. I like corners where it needs work to get the right line, Coram at Snetterton is a great example. Then I had ANOTHER issue. 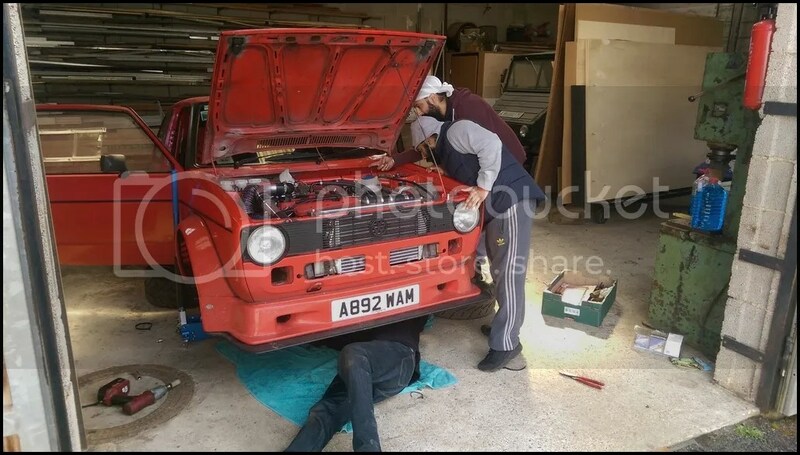 Earlier in the day I`d checked the manifold bolts hadn`t loosened after my recent swap to 10mm bolts. 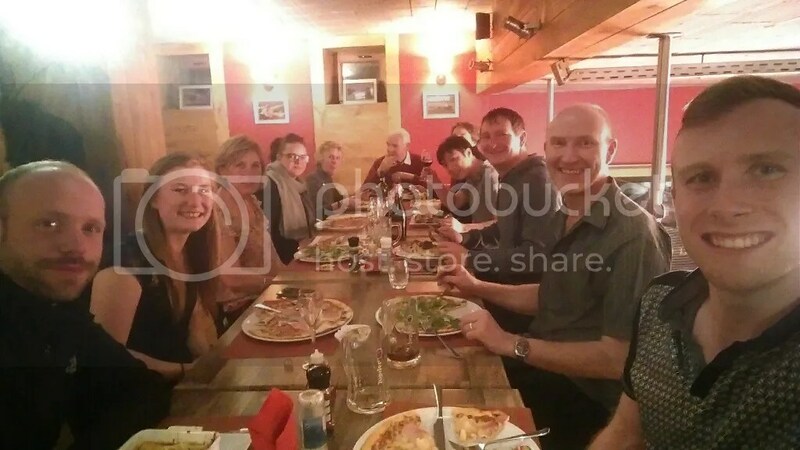 They hadn`t but the EGT sensor, top right in the photo was about to cause an issue. The bloody thing fell out. 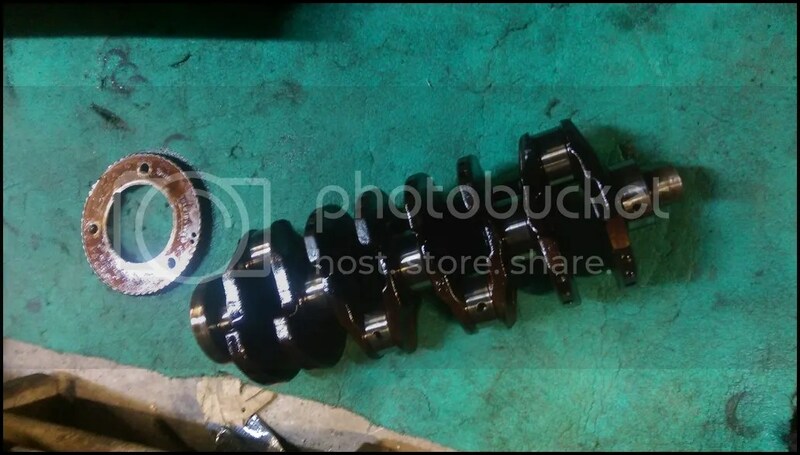 I am used to tightening nuts and olives, it`s something I do very often at work but what I hadn`t done was retighten this when it was HOT and had expanded. 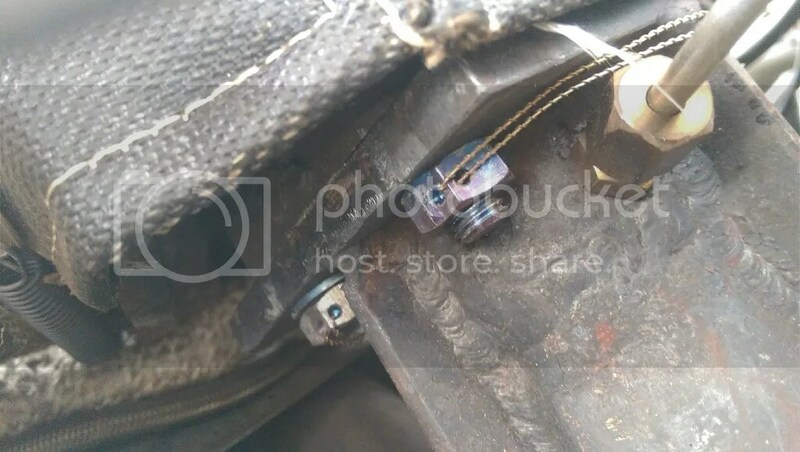 I heard a blowing noise and immediately thought it was the manifold but back in the pits and the sensor dangling in fresh air proved otherwise… This was an issue, I didn`t carry a spare nut and olive. What I did was tap the middle of the fitting M6, then tightened and locked a bolt in place to blank the hole. Refitted and it didn`t leak again. I`ll replace it with a new fitting, nut and Olive and ensure I retighten when it`s hot. Back to the hotel for a quick shower then out for a Pizza. Spent the evening discussing what a cracking day it had been. 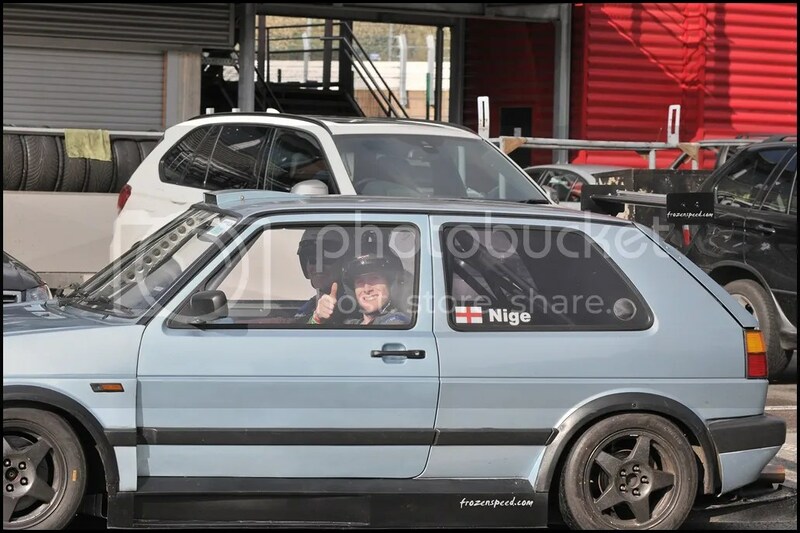 Whilst I`d had my fair share of issues and even caused a Full Course yellow, I`d still had a good day but was left feeling a little underwhelmed. The issues with the car had taken the edge off and I didn`t like that. All the ingredients were there but little things had conspired to spoil it. What probably frustrated me is that they were things I hadn`t forseen. If it had been a boost control issue that I hadn`t fixed after Donington, that would have been my fault but it wasn`t a problem. They were all little irritations that kept coming one after the other limiting my lapping to 130 miles. That`s pitiful. I was convinced that Thursday would be a better day although driving back to the hotel after the meal in the rain didn`t fill me with hope for a dry day. Woke up just before the alarm and looked outside to see dry roads ! The rain from the night before had gone and it was drying. This could be a good day after all…. 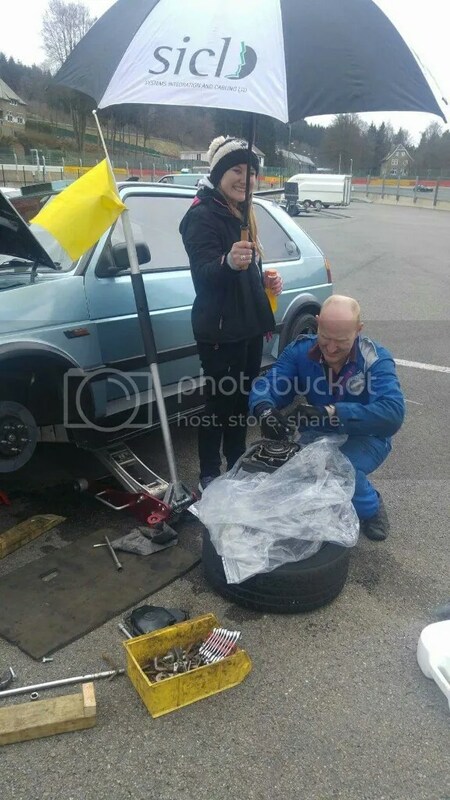 Arrived at the circuit before 07:30, pulled the cars and trailers outside and decided to give the car a quick check over whilst I swapped the brake pads from side to side. They taper as they wear but if I swap them over it evens the wear out a lot. 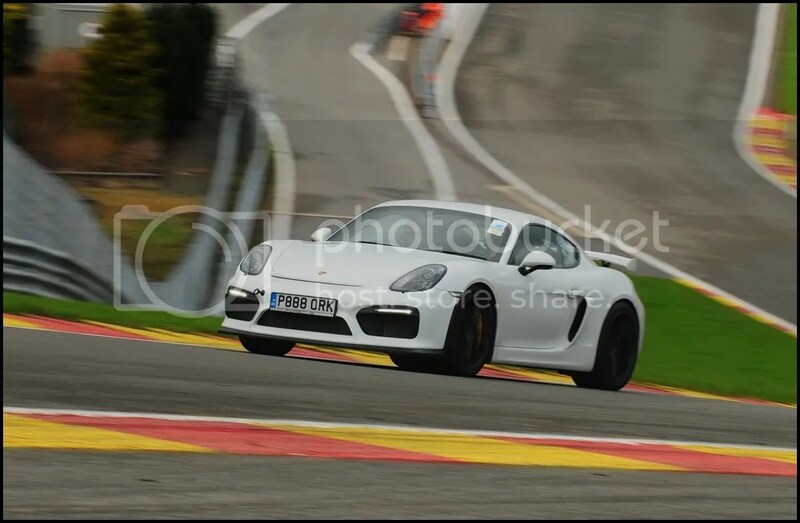 After 2 days is usually enough but there were some heavy braking zones at Spa so I thought I may as well do it this morning. 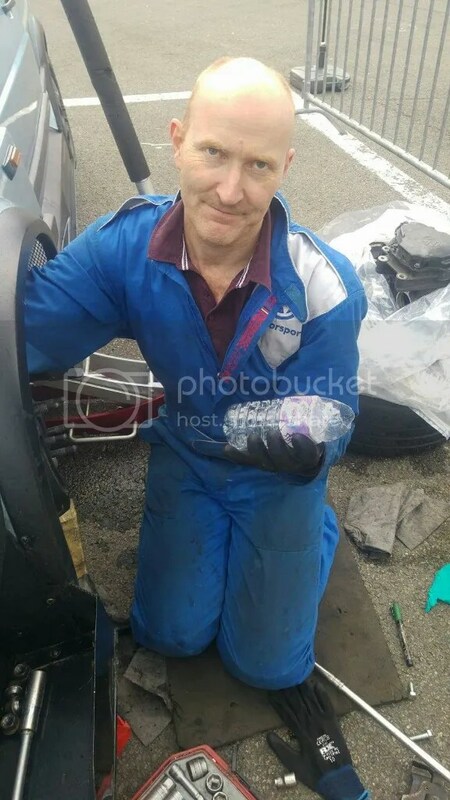 Whilst I was doing that, Gurds was replacing the drivers side wheel bearing. I`d taken my tool to swap it in situ so it was a reasonably easy job. 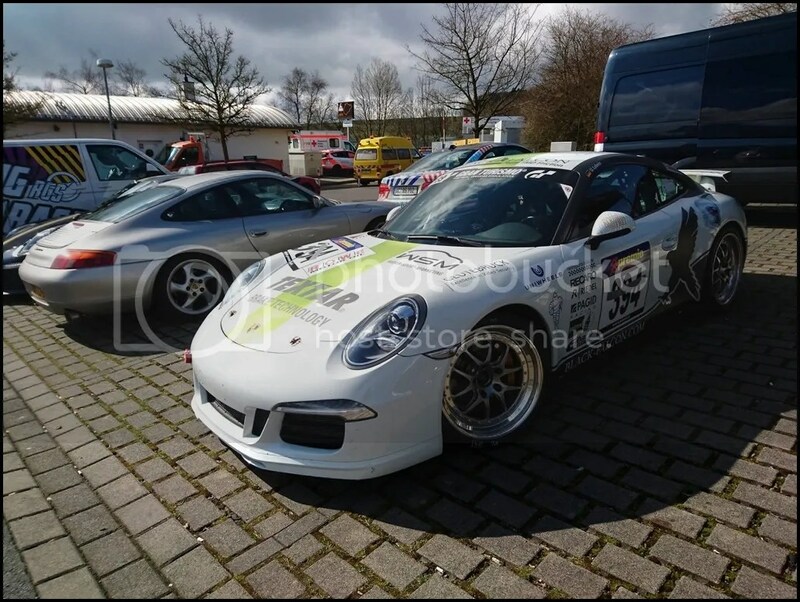 The driver of this Porsche had reported a knocking and Matt offered to take a look. He assists Andy when he`s running Porsches for Podium prep so is starting to know his way around them. The Porsche had broken the tensioner for the power steering pump. 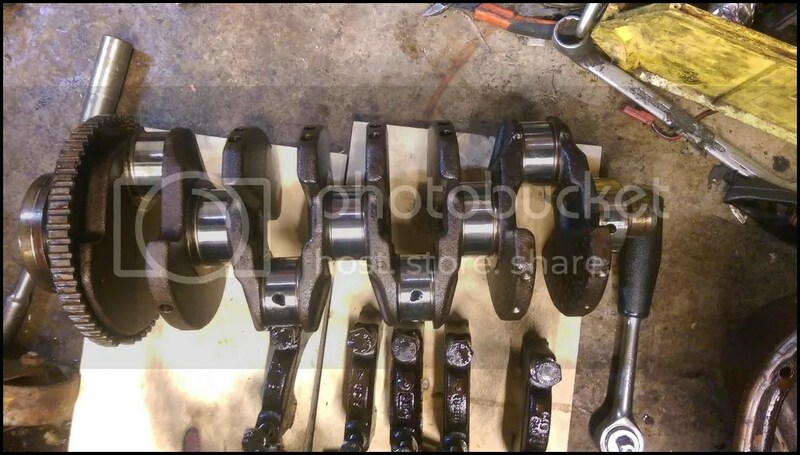 It`s only 2x m8 sphericals and one had sheared. 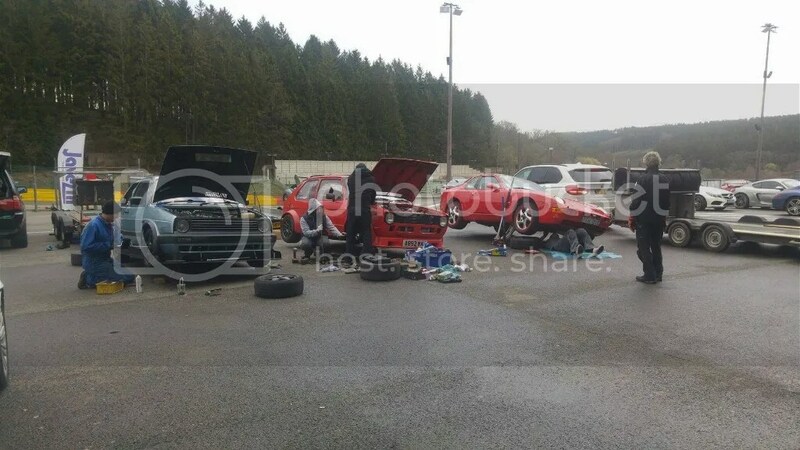 A common problem and Andy replaces them on the cars he prepares. 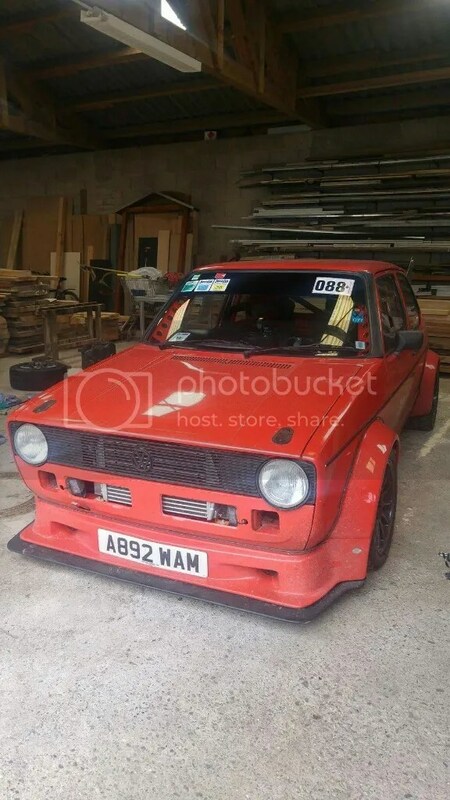 Fortunately Geoff Steel Racing were there with a welder and welded it up for the guy. Not a long term solution but enough to get him away and he was a happy man once Matt refitted it for him. I bled the brakes. 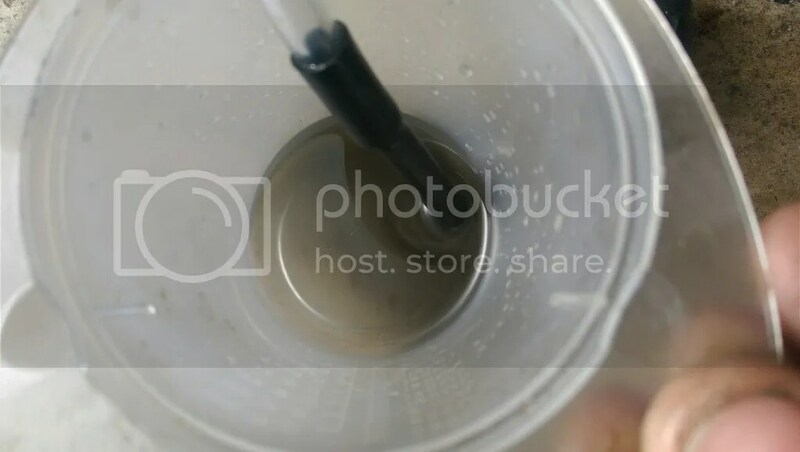 I think I need to flush the brake fluid…..Yes, that`s the brake fluid from the front calipers. Whilst I was doing that, it was time for the sighting laps. Cat seemed a little nervous. 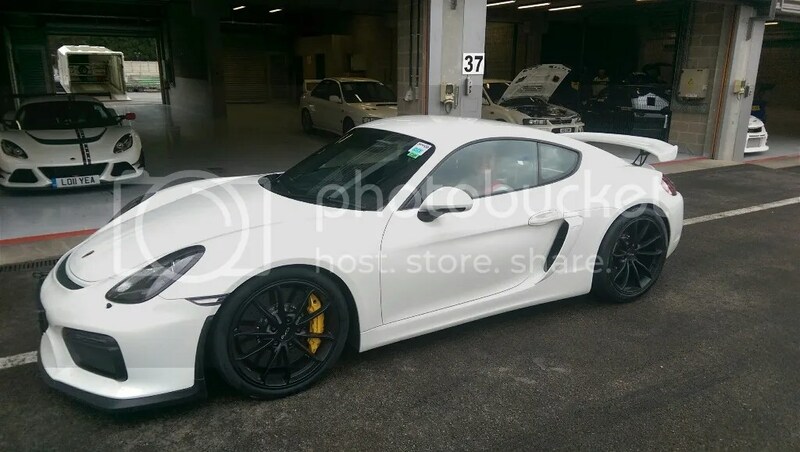 The first car out was the GT4. Andy was having a word with the driver telling them to be particularly careful. You are probably sat there wondering why he`d do that. Well, Eric had offered to let Cat drive it ! 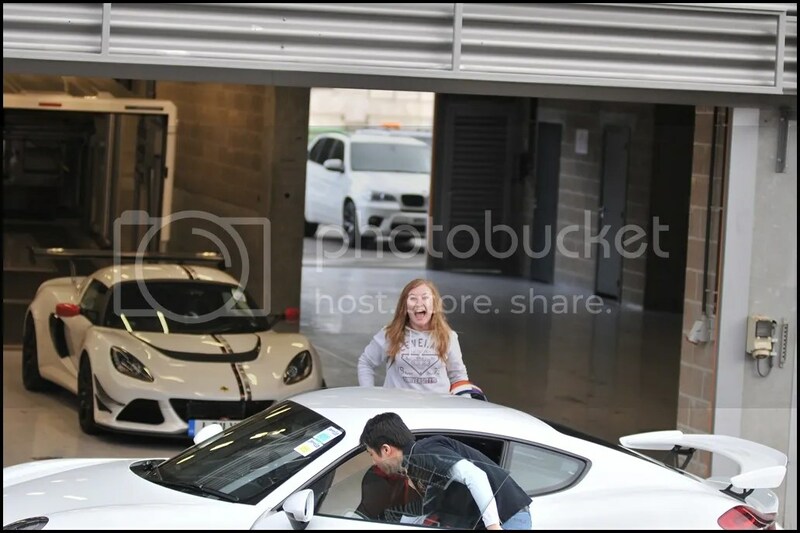 Andy let her out first too so she was the lead car behind the pace car. Not only did she drive it on the sighting laps, Eric told her to stay out for another couple of laps once it went green. I still don`t think she could quite believe what had happened. Seeing her so happy was a particular highlight of the trip for Lou and I and I`m really grateful to Eric for giving her the experience. It was wet first thing so I fitted the R1R`s and went out with Ram. I went in too quick at the left hander after Rivage and started to spin. Ram asked me afterwards why I didn`t nail it and try to catch it. I usually do but I just felt it had gone too far and it was easier to stop rather than gain speed and risk hitting something. 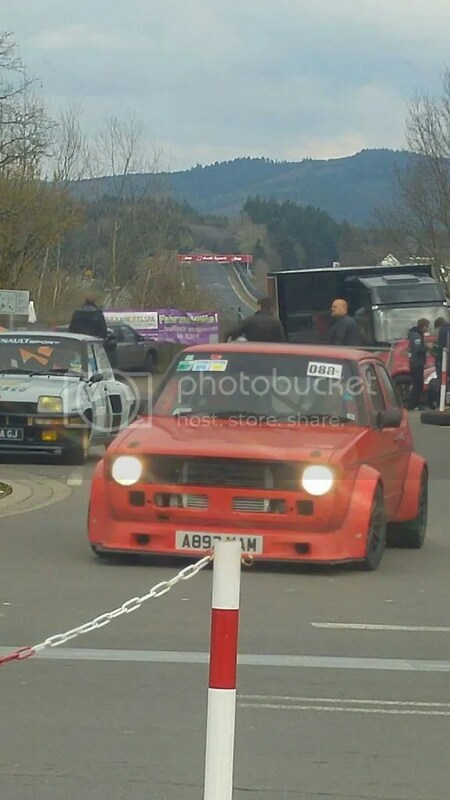 It wasn`t a particularly conscious decision but I knew exactly why I was doing it and was able to explain it to him as we were going round Pouhon. I think you just instinctively know if you are likely to save it or not and react accordingly ? I know I did. Back into the pits, deep breath and back out again. Everything was OK and it was starting to dry up. Garry was lapping in the MX5T and seemed to be enjoying himself. As those who know me will confirm, I`m a rubbish passenger. I much prefer to drive but will sit next to someone every now and then. I`m particularly bad sitting next to Matt. 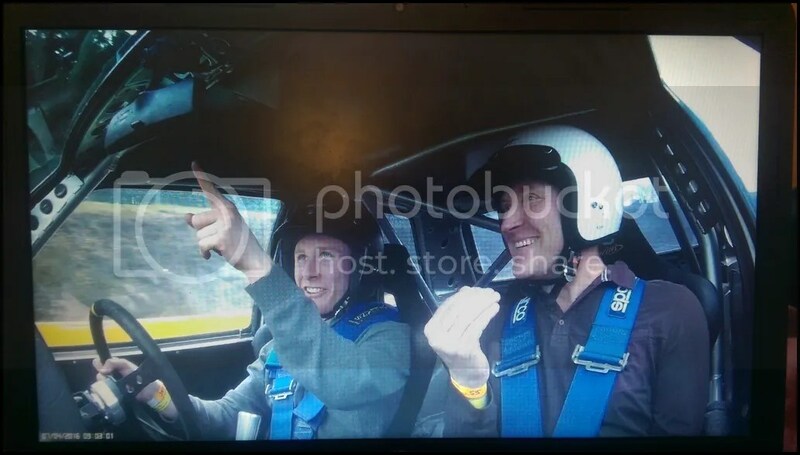 When he started driving on circuit a few years ago he was quick straight away and I don`t really know why I feel uncomfortable sitting next to him. 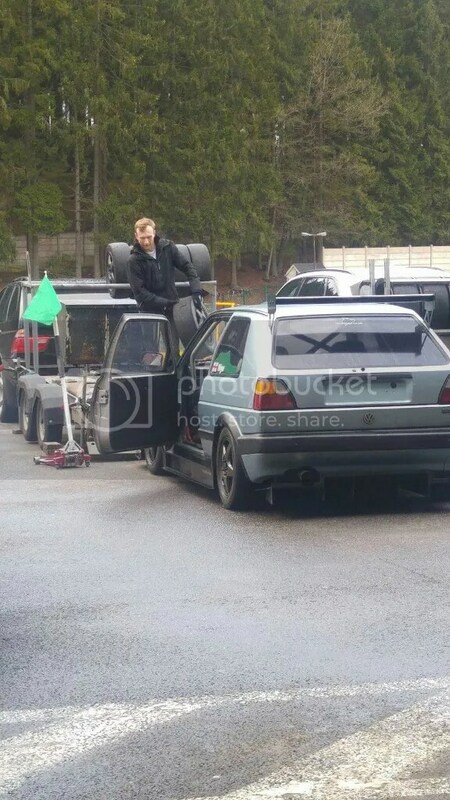 It is even worse when he`s driving the Golf. We went out and he was smoother straight away, he`s learned to build up over a few laps rather than try and go out quickly. I`m learning how much to talk to him and explain things, I used to talk too much but I`m getting better and not overloading him with information early on. 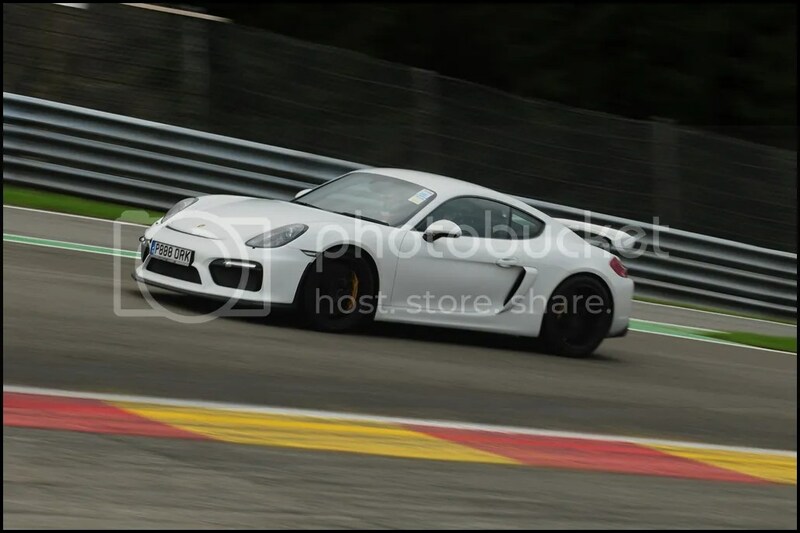 On his 7th ever lap of Spa he did a 2:55 so he must be doing something right. Or as I prefer to tell him, I`ve built a fantastic car and my tuition is top notch. He is getting used to the Golf but prefers his 328. I can understand that, he knows the time I`ve put into the Golf and whilst I know he wouldn`t do anything intentionally the atmosphere at home wouldn`t be wonderful if he binned it…. It was just before lunch and I was talking to Lou and Hayley. Rather than the `green` flag signalling everything was good, I wanted one that was `Better than green !” The day was going really well, no issues and no closures. I`d done almost as many laps on Thursday morning as I had all day Wednesday. Replacing the Wheel bearing had solved the vibration Gurds was experiencing and he was happily piling on the laps too. Considering he didn`t have the amount of Aero I did, his laptimes ended up being very close to mine. Short lunch break and time to reflect how well it was going. Typically, it rained whilst we were waiting so I fitted the R1R`s and then went out with Sahib when it opened. Gurds was behind us with Matt as his passenger and he followed for a while, then I let him pass to get some footage following him. I know his lines aren`t ideal. 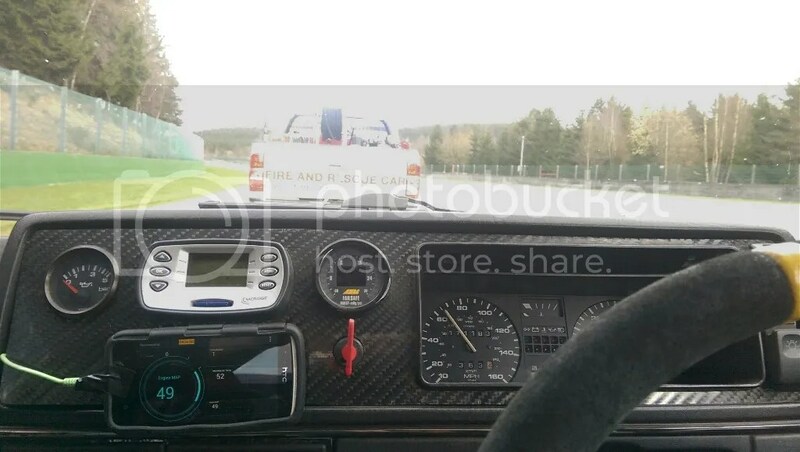 He does too but wanted to try and see if there was more grip `off the racing line` as it was still greasy on 888`s. The first 6 minutes are me ahead, he passes at 6m 30s. 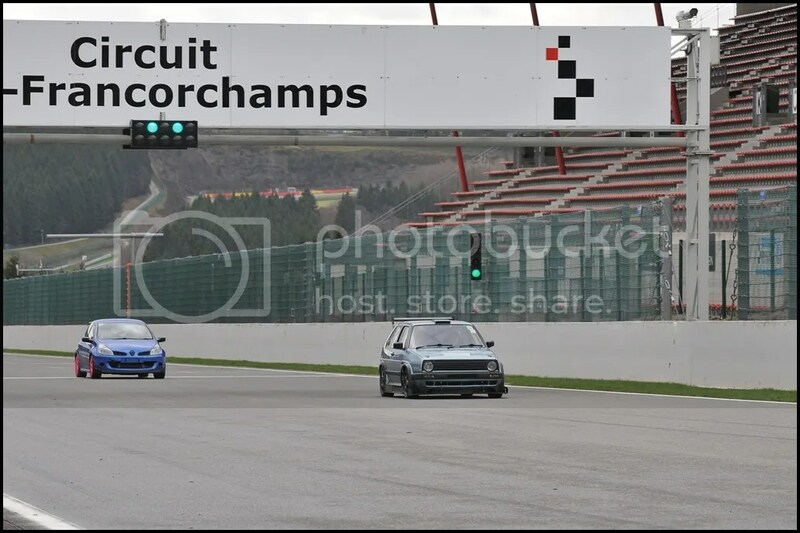 It was interesting to follow closely, I really enjoy those laps with mates when we are both happy driving in close formation even if they aren`t the fastest of the day. The track started drying so I swapped tyres and went out with Matt. The forecast was for rain later so we wanted to get some dry running whilst everything was going well. I was feeling really confident and decided to trail brake to see if getting the rear mobile would help. As it turned out, that`s easier said than done.. I can easily get the rear moving but kept instinctively steering into the slide instead of straightening it up and flooring it. I did it everytime too, got the back end moving then corrected it and stopped it. The car felt fantastic through Blanchimont and even before there, I was able to get onto the power early out of Stavelot. It`s similar to the ring lap I did last year where it all felt to come together in that one session. Unusually for me I did my quickest laps when I wasn`t following / being followed. 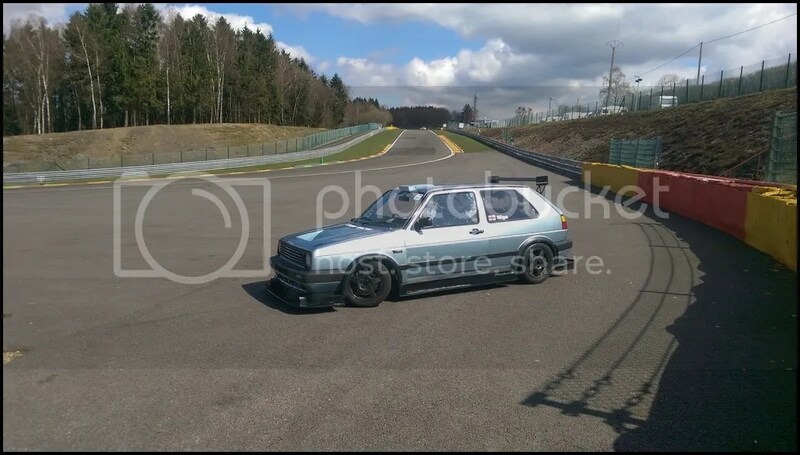 That`s usually the time when I drive quicker but this session I did it on a clear track. Outbraked myself into the first corner AND the Bus Stop chicane but it was still my quickest lap of the day even though I lost 1.7 seconds on those 2 corners compared to other similar laps. The track was still slightly damp in places and not as grippy as before lunch but I`m still delighted with how it went. 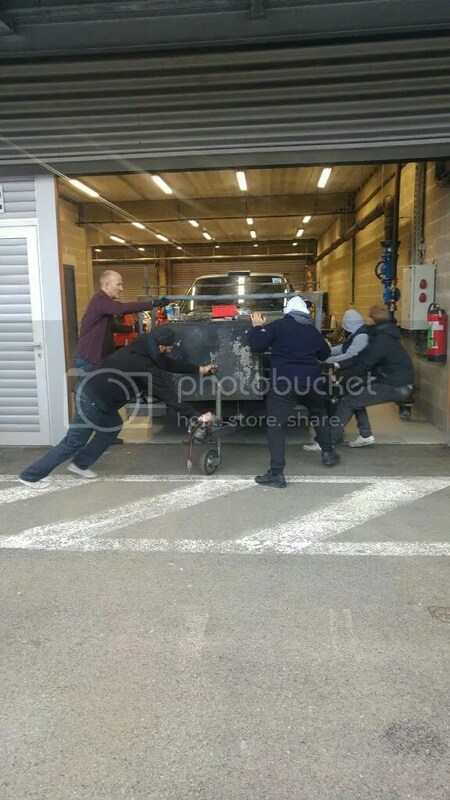 Then the missing started again so we came into the pits. Tow truck arrived as I caused the second Full Course Yellow in 2 days. The tow of shame all the way down the pitlane. Again. 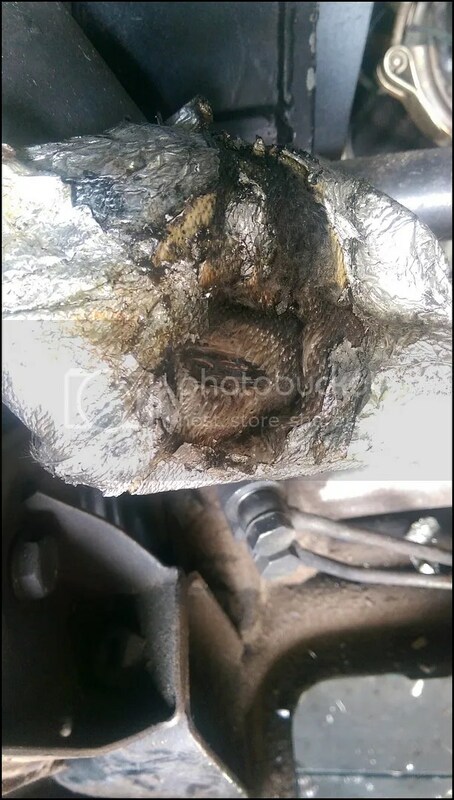 When trying to turn the engine over it had a very unpleasant noise deep inside. Andy suggested something to do with the crank. I did a compression test and it was all good. Removed the Crank Position Sensor (easier said than done) and with the car in gear pushed it back and forth. The crank could be seen turning, but the trigger wheel never moved. 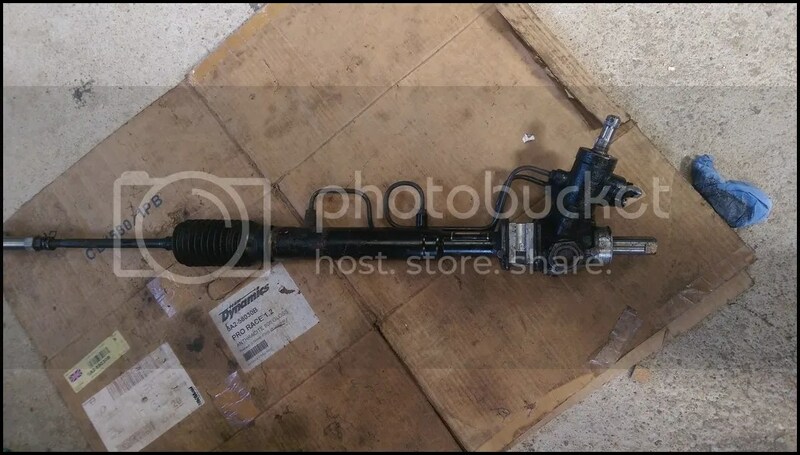 Game over, the trigger wheel should be bolted to the crank and it isn`t something I can fix in a paddock. This is what mine looked like when I stripped the engine back in the UK on Sunday. 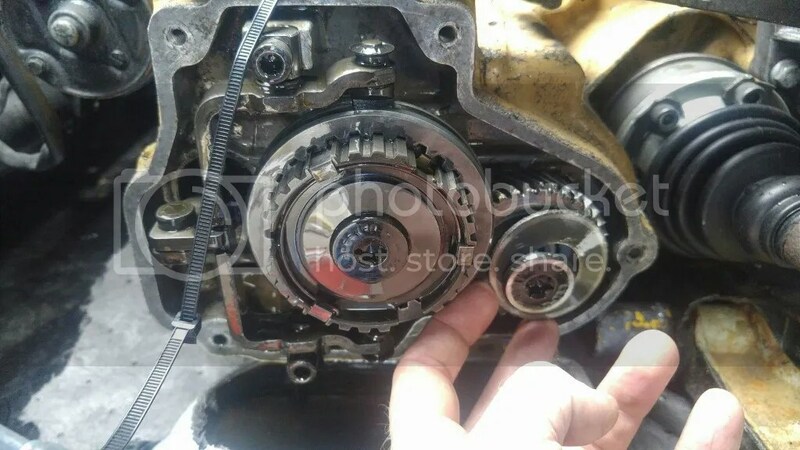 Eventually found out the flywheel assembly was vibrating badly and this caused the 5th gear bolt to loosen and also to pass vibration through the crank and into the trigger wheel, resulting in the failed securing bolts. 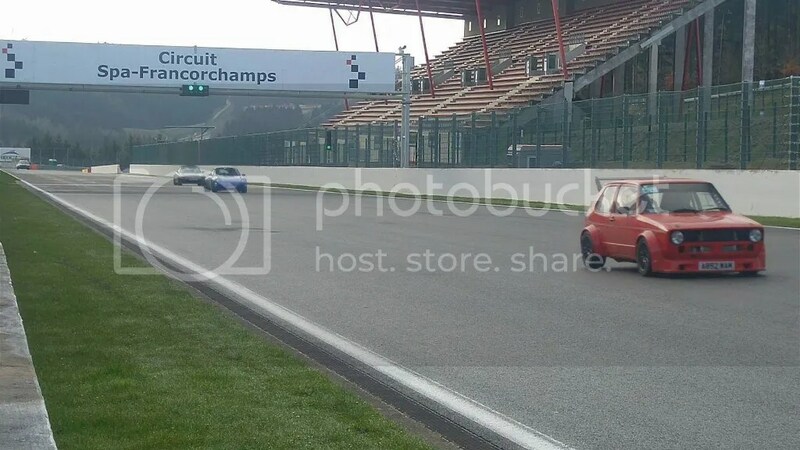 It was 4pm at Spa, there were under 6 cars circulating with 2 hours left to go on a glorious day. I was rather fed up. However I didn`t sulk or stomp off. 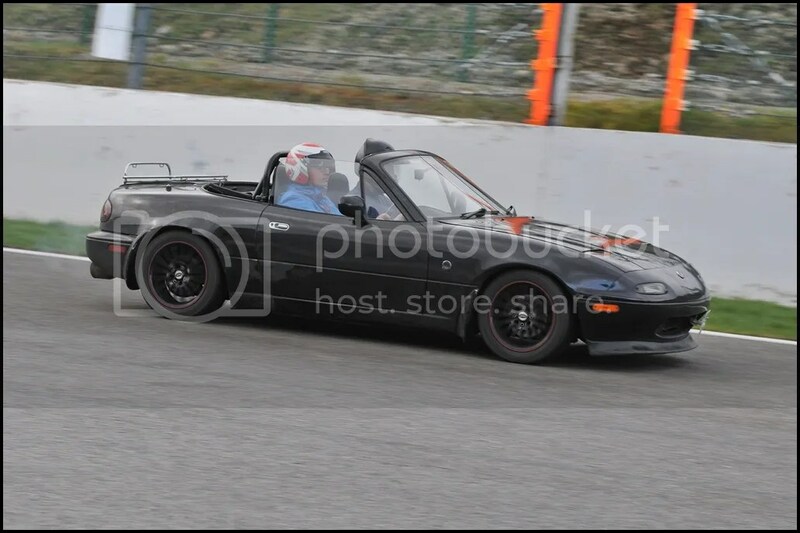 I can say with some confidence that my `Good trackday experience` glass is full to the top. Whilst I took a big gulp out of the glass, it isn`t empty yet . It`s easy to get annoyed or despondent about these things but it was a failure on a part I could never have forseen. 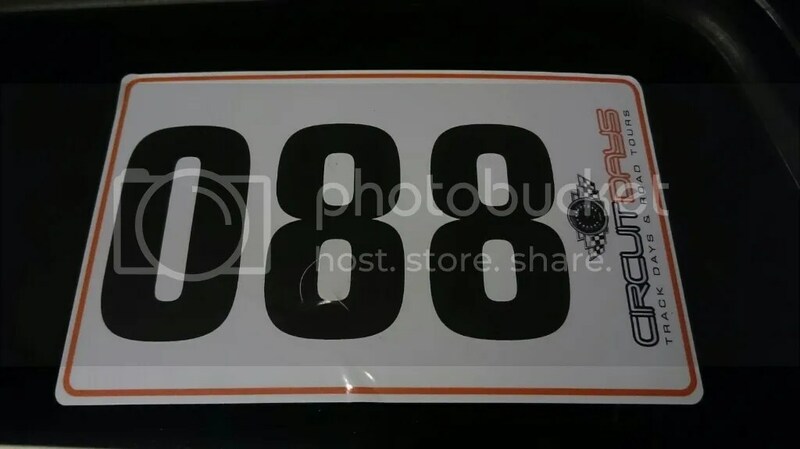 They are a known weakness on these engines if people rev them high in a N/A setup, approaching 8k and above but mine revs to 7,200 and that limit has been used by many people for many years on these engines in track cars without failure. It was time to packup, get everything on the trailer and head off to Nurburg ready for tomorrow. 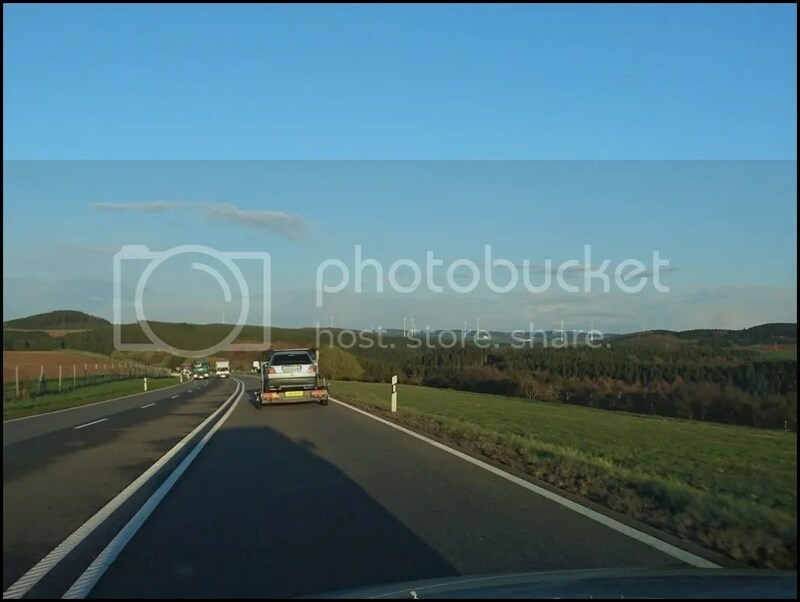 Unfortunately I wouldn`t be driving once we arrived…. 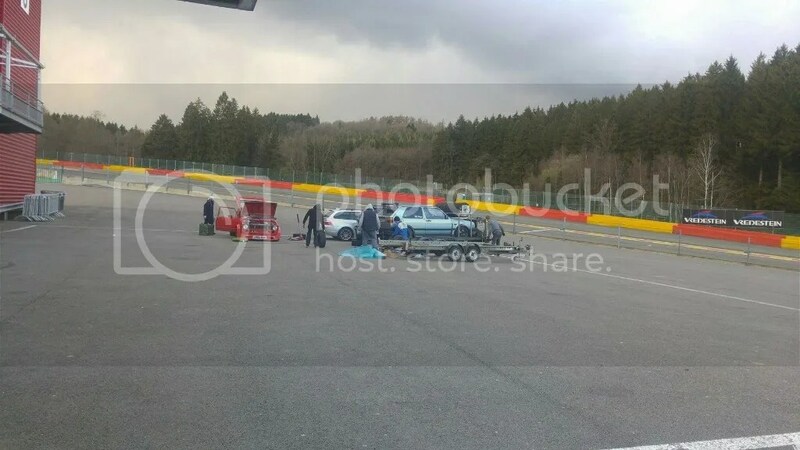 By the time we`d loaded up, the Paddock was almost empty. 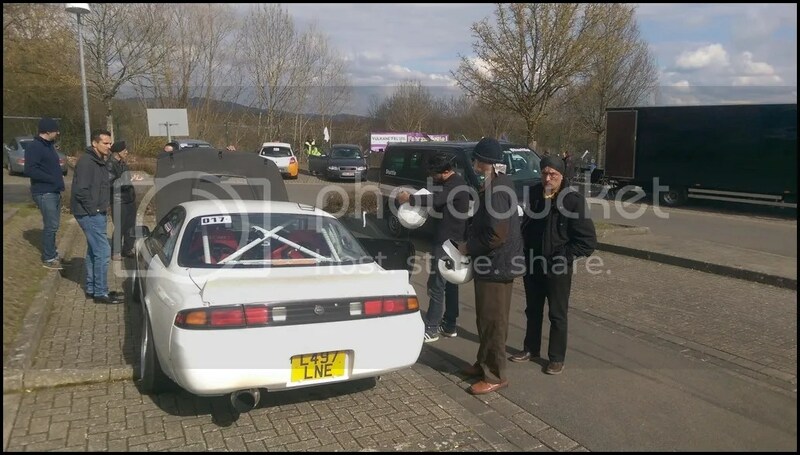 The plan had been to get across to Nurburg to give Chris a hand with the signing on but by the time I`d diagnosed the engine issue, it was almost 7 by the time we were loading up to leave. 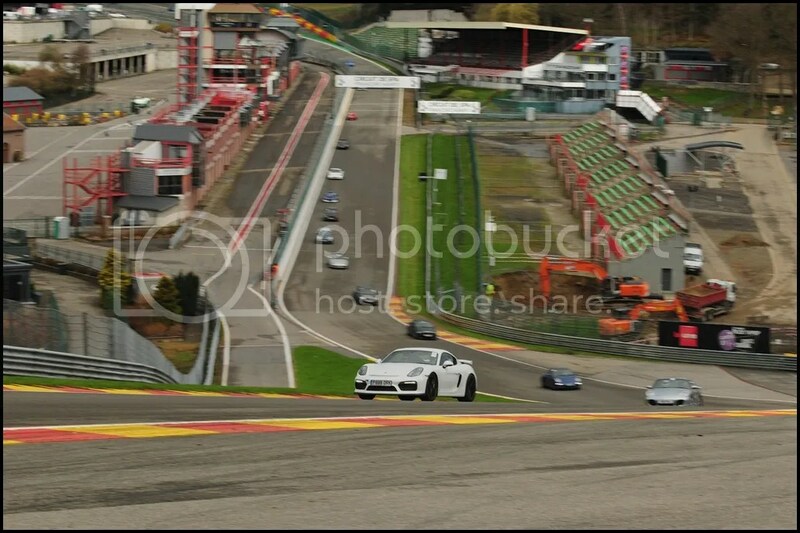 I`d had a couple of days at Spa, with friends and perfect conditions. I managed to get in some fantastic lapping and the trip was certainly worthwhile. I remembered why I class Spa as my favourite circuit. The challenges it gives now I have more power with better brakes and suspension is very rewarding when you get it right. 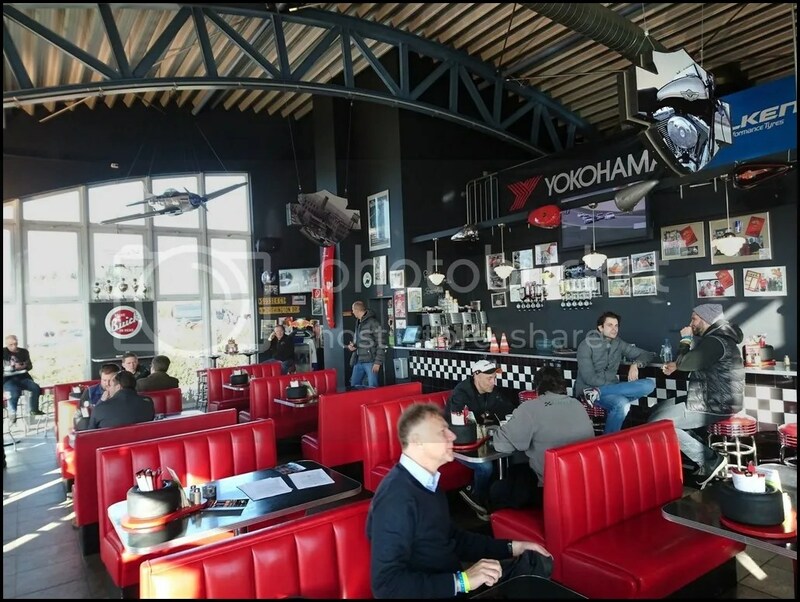 Matt and I both know there is more time in the car, the data shows that quite clearly but even without knocking another second off my quickest lap, it`s still far quicker than I expected after my last visit back in 2011. 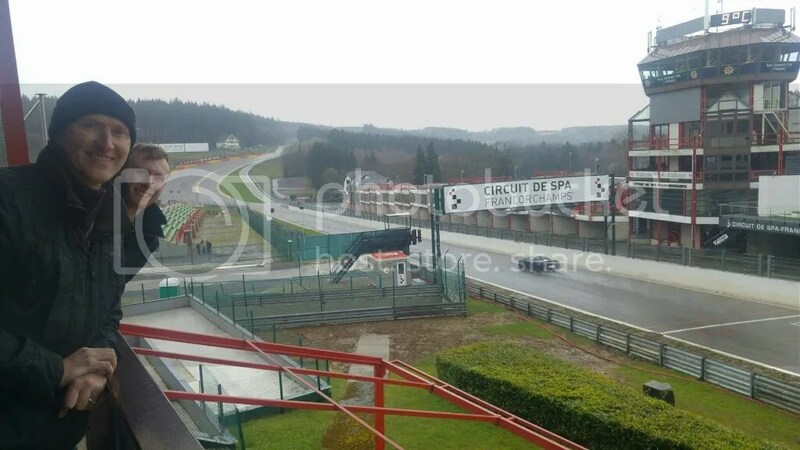 I had my Spa stickers, but the space reserved for the 8th April with Circuit Days was to remain empty. Time to leave Spa behind for 2016 and head over to the Nurburgring. Everytime I arrive everything feels so familiar ! Arrived at parked up then popped up the the Lindenhof to see Martin in his new establishment and have a Burger to eat. Very nice they were too. Lou said she`d drive so I could have a couple of pints to drown my sorrows. I took her up on the offer and had a few beers. It was great to be chatting with everyone but there was always the discussion along these lines. 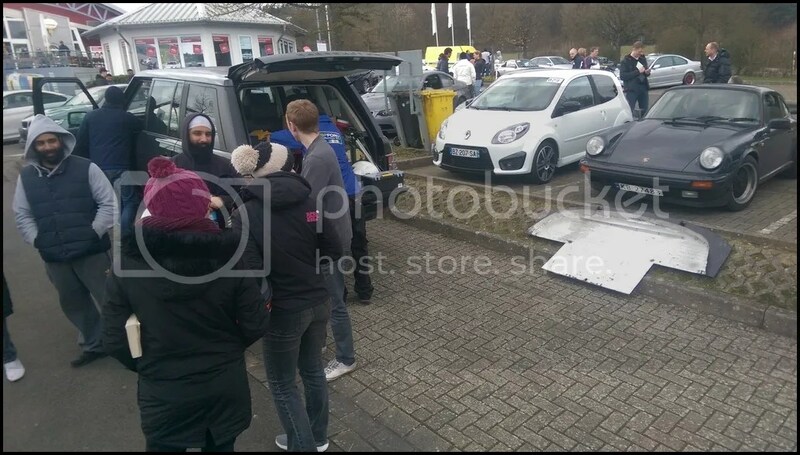 The idea on Friday was to arrive early at the Ring carpark, assist with the signing on and then get driving. The fact I wasn`t driving put a rather large damper on things but we arrived early and had a glance around the empty carpark. Look at that sunrise ! A sign of the perfect weather to come. The weather was perfect and the carpark nowhere near being full. 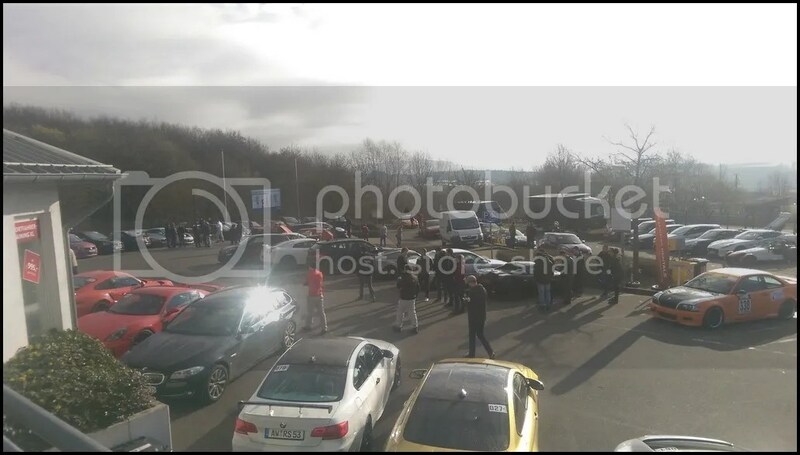 There was the usual wide range of cars in attendance. 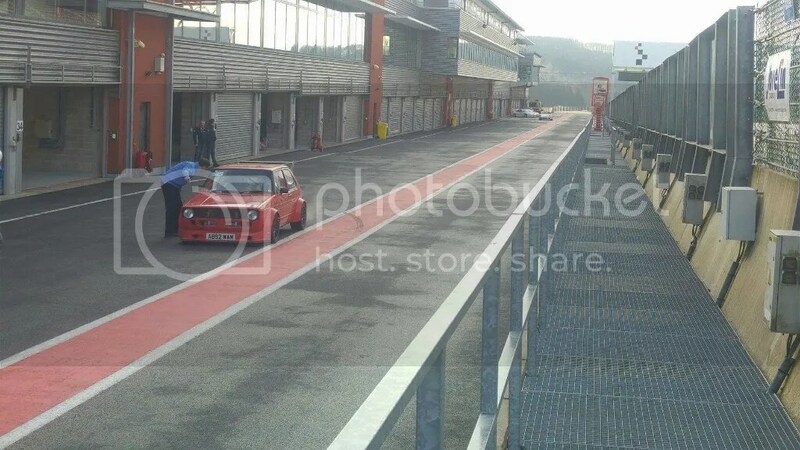 You don`t often see these on a trackday ! Matt was going to drive the Golf for the first `sighting hour` whilst I sat in with Gurds. The plan being he`d drive all morning whilst I brought Gurds up to speed through the morning, then he`d start following me after lunch. He`s only done just over 50 laps and the plan was to safely accelerate his learning. The track was icy in places so the circuit staff delayed these laps. 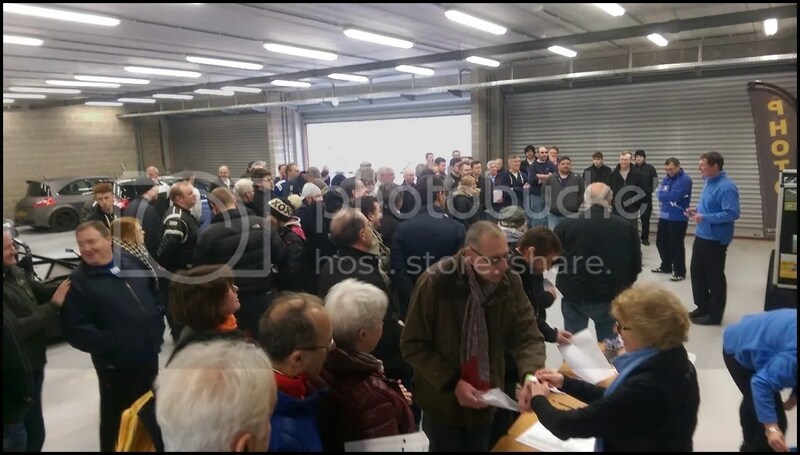 People were starting to get anxious to get on circuit and when it did open for the sighting session, this was reduced to 30 minutes to ensure there was still a sighting session, but the tracktime was maximised. I immediately jumped in with Gurds and out we went. We`d already discussed that I`d talk as we went round, almost giving a running commentary of where he needed to be as we approached a corner. `I Can`t, it`s jammed` !!! Not really what I wanted to hear. He lifted off and the steering freed up and worked as normal. Very odd and obviously not something we wanted. A bit of testing for the rest of the steady lap and it was only on right handers and only at a certain steering wheel position. Back into the carpark after a rather eventful first lap of the day. 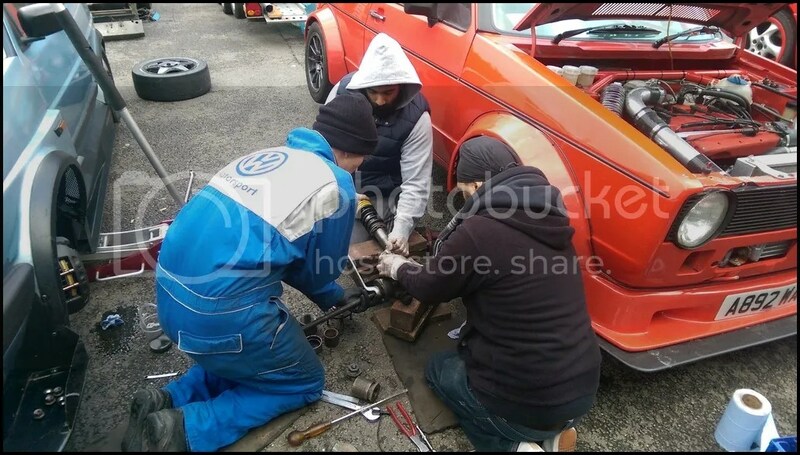 We drove to the guesthouse where Gurds was staying and used the method I`d done to identify the loose steering rack last year. 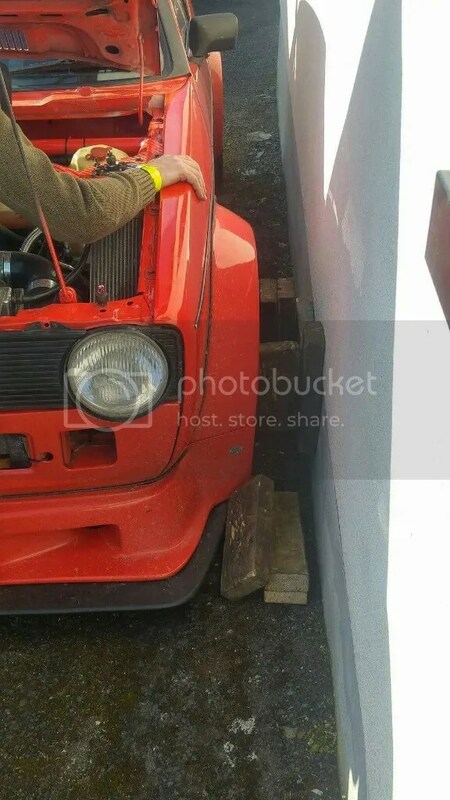 We thought the rack could be moving under load so wedged wood between the wheel and the wall, Gurds turned the wheel whilst I looked for any play in the steering. Nothing jumped out at us so we jacked it up and had a look underneath. The UJ seemed close to the bulkhead so we `massaged` that a little. Back to the carpark and out for another lap. Approached Flugplatz with more caution and it did the same again ! Nothing for it, back to the guesthouse and we whipped off the steering rack. All 5 of us made short work of removing it and then Gurds and I stripped it whilst the others looked on. 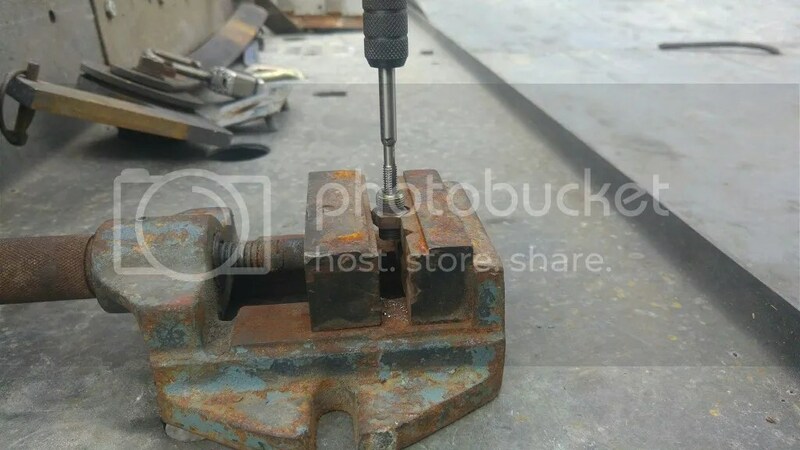 The rack was a recent addition and although it was second hand and seemed fine, we actually found a lot of debris in the pinion and also between the teeth on the rack. Cleaned them all out with a scraper and small brush and instead of needing to push it hard to move, it now freely slid from side to side. Refitted and ready to go. The track had closed due to an incident and it was a perfect offoptunity to grab a bite to eat. Most people I spoke to afterwards said it fell around the time they planned to have lunch anyway so it wasn`t TOO bad. 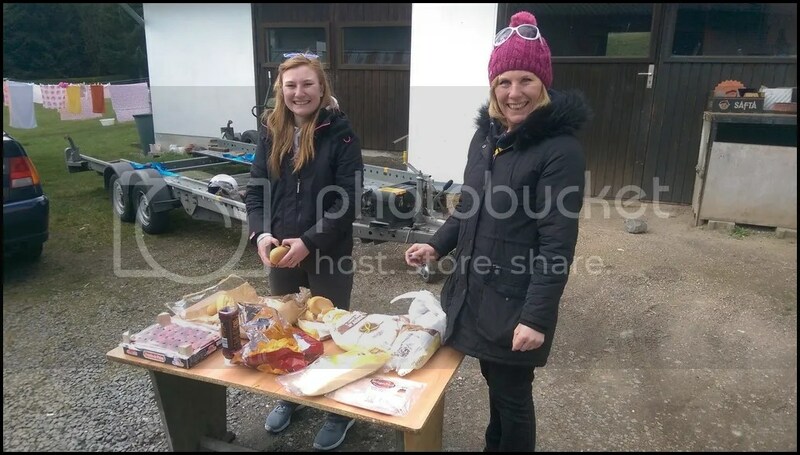 Lou & Cat supplied a lunch of sandwiches, drinks and fresh fruit. Time to head back out and I jumped in with Gurds again. We were tentative round Flugplatz but the steering was spot on. 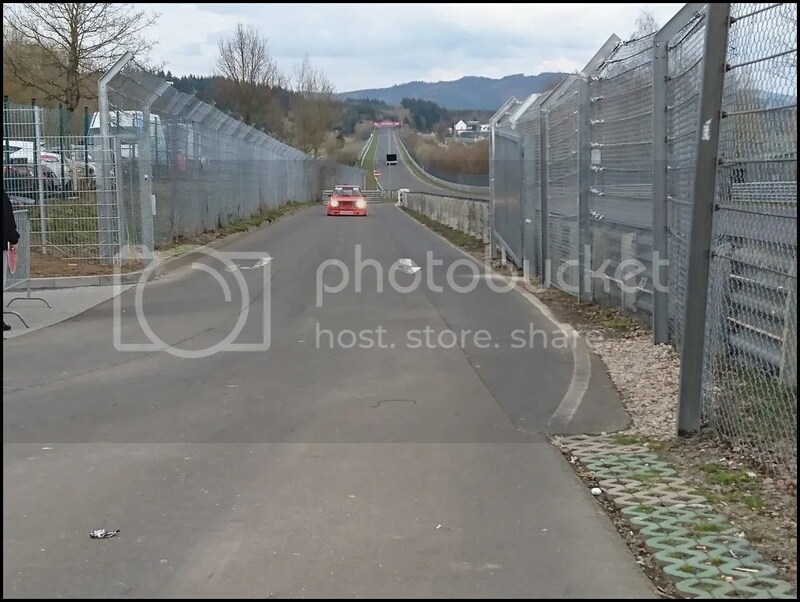 We aren`t quite sure why it manifested at the ring, perhaps the right hander at Flugplatz and the increased grip with the new tarmac all came together at a certain steering angle to cause the sticking but it was sorted now so we could start pressing on. My friend Chris was there from Holland. 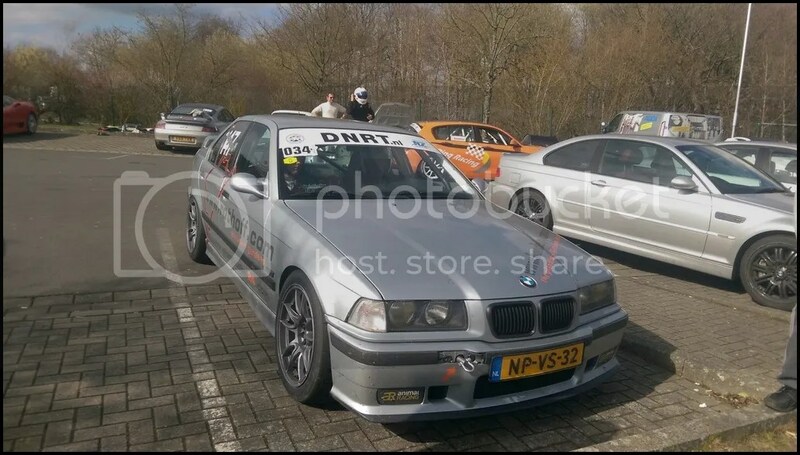 He races in a dutch series in his M3 but was there testing his freshly built E30 for an upcoming 3 hour race on the Norschleife. 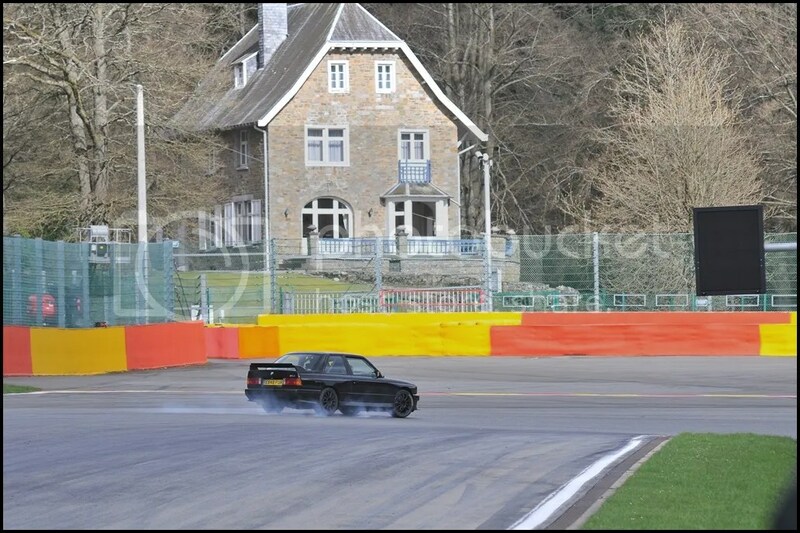 The E30 performed flawlessly and he was very happy with how it went. Out for the 3rd lap with Gurds and he was starting to understand what I was trying to explain. I don`t do enough instruction with different drivers to be able to quickly understand what they need to know. I`m good with Matt and we both communicate well. That wasn`t quite the case with Gurds. Even though we`d discussed it previously, it`s different at speed. He started to turn the wheel and I told him to keep going straight. The car dropped in perfectly and his eyes widened as it made sense. 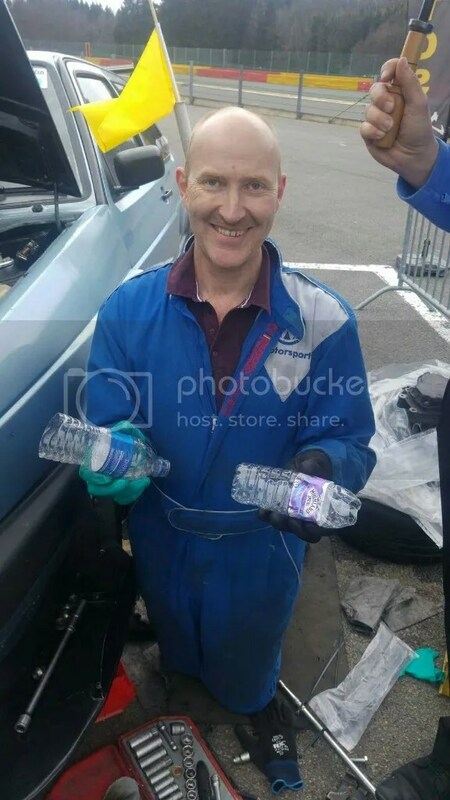 We had several of those `Eureka` moments where I`d try and explain a particular line but he didn`t quite get it right so the car didn`t feel as good. When he did get it right, he immediately knew it was right. You can just tell when the car flows through a sequence rather than fighting it. We had a bit of a moment when he went over the Pflanzgarten jump with a light application of brakes “Gurds, don`t EVER do that again..”…. 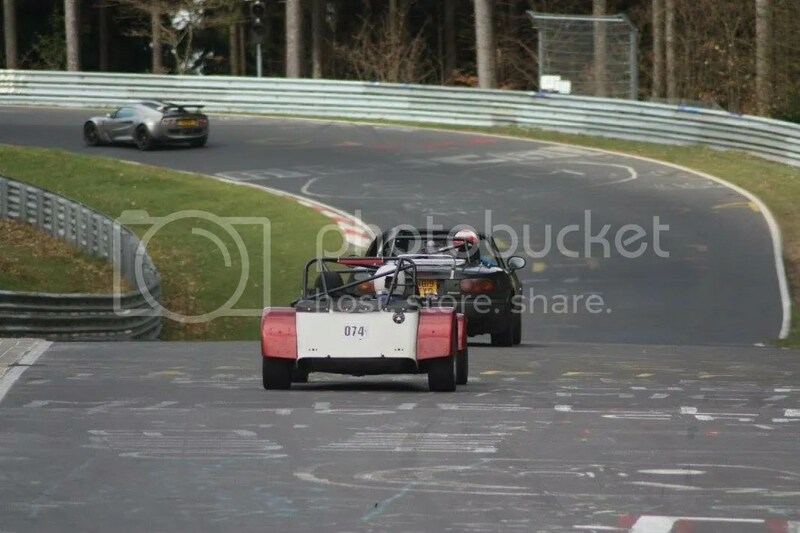 Just round the next corner and he`d been too far in the middle of the track for the left hander. This time he kept it further right and I tried to say that his car was positioned right for the turn in to the blind left hander. He took me to mean turn NOW and put 2 wheels on the grass doing so. My fault and a very timely reminder that the person talking has to be on the same wavelength as the driver. It only happened that lap and we didn`t have any other similar issues. He wasn`t using all the track width but that was to be expected and he was addressing it with every lap he drove. 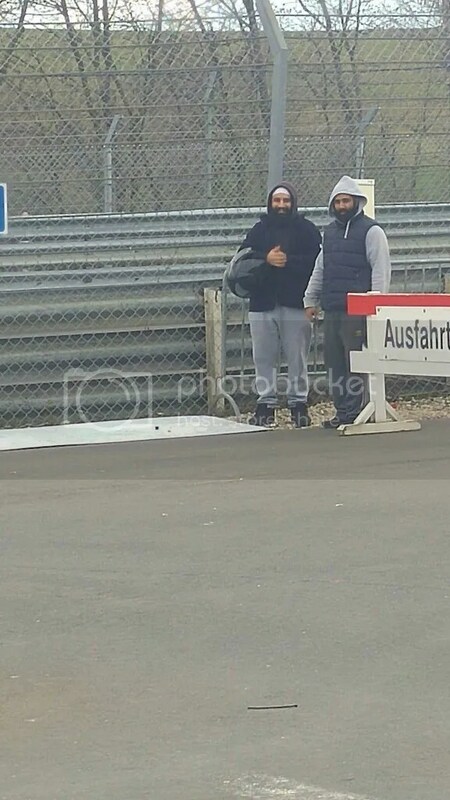 It was his first Nurburgring trackday and I was interested to hear his thoughts on it after only doing TF before. 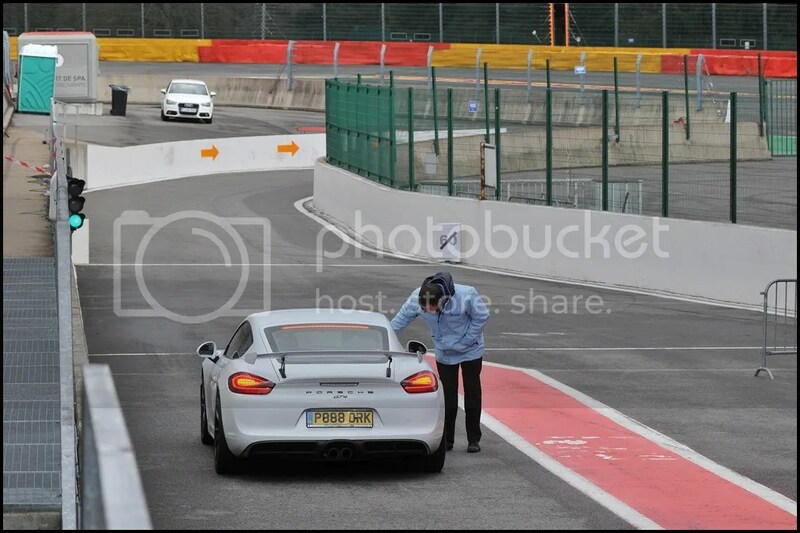 He couldn`t get over how quiet it was on the track and in the carpark. No struggling to park, some laps were totally clear and the lack of Motorcycles and very slow traffic felt reassuring. 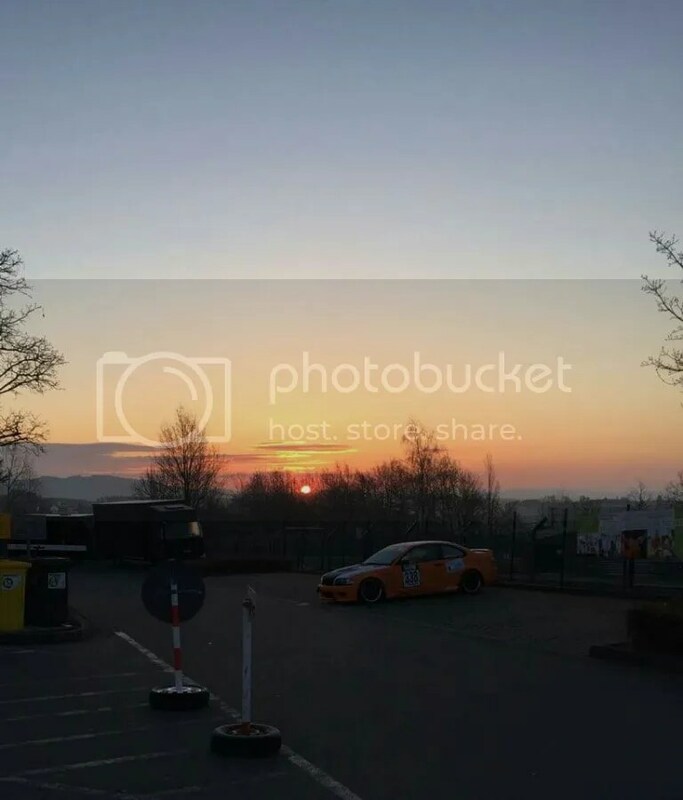 He felt that he was able to focus more on the actual driving on the trackday compared to TF and said it was doubtful he`d do TF again, even if insurance wasn`t a concern. We were very fortunate with the weather, apart from the icy start the day was glorious. 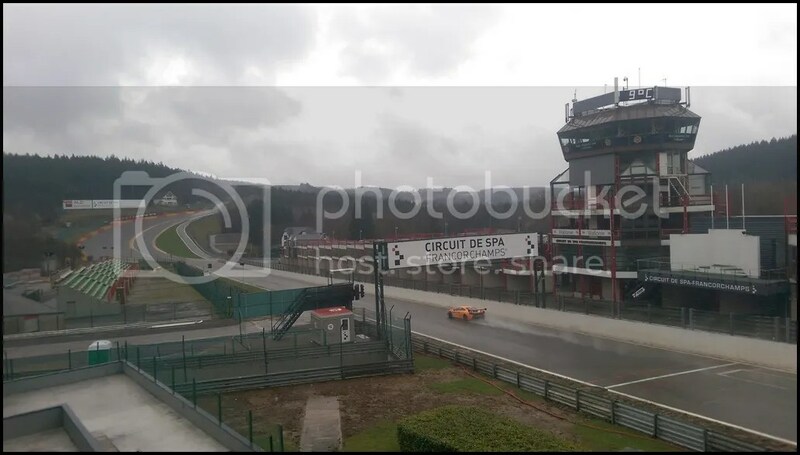 This was early April and whilst some people were nervous about booking a day so early, those who did were rewarded with a track that allowed as much clear lapping as you could ever want. Talking to people in the carpark and they all said the atmosphere felt very relaxed. There didn`t feel to be an urgency to get out and lap. 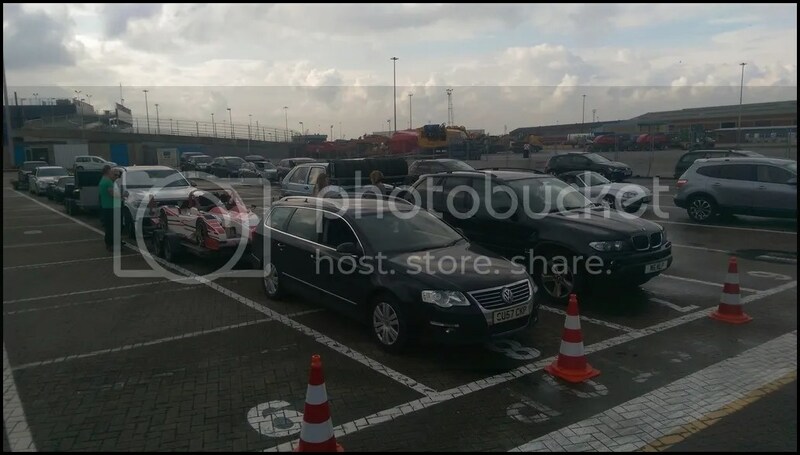 Obviously everyone had paid to drive so weren`t going to sit in the carpark all day, but it wasn`t like a busy TF weekend where you knew you had to get out when the track opened as a closure wasn`t far away. Sahib had been out with Karan for a lap earlier and was completely blown away by it. 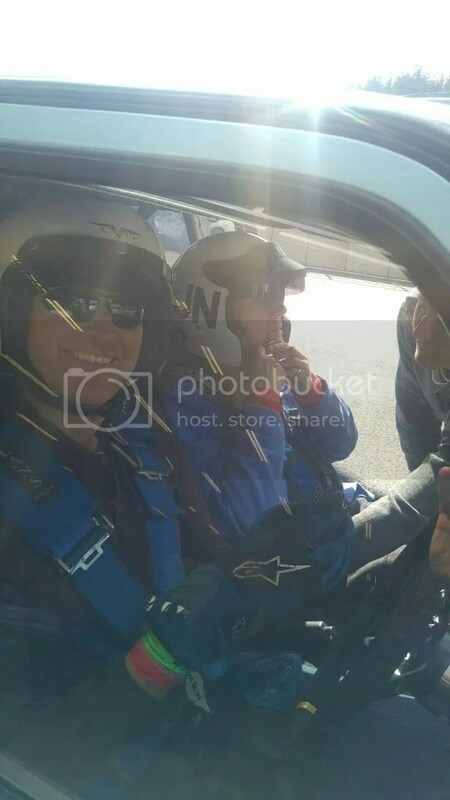 For your first ever lap, being sat next to Karan in the 400+HP Silvia being pedalled by a very skilled driver is something you`d never forget. 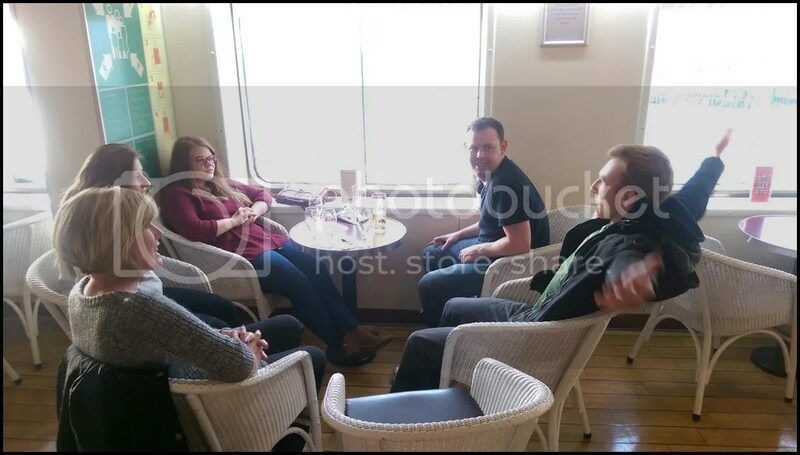 Matt hadn`t had any laps at all so I had a chat to Chris. He was just about to go out in the M3 for several laps. 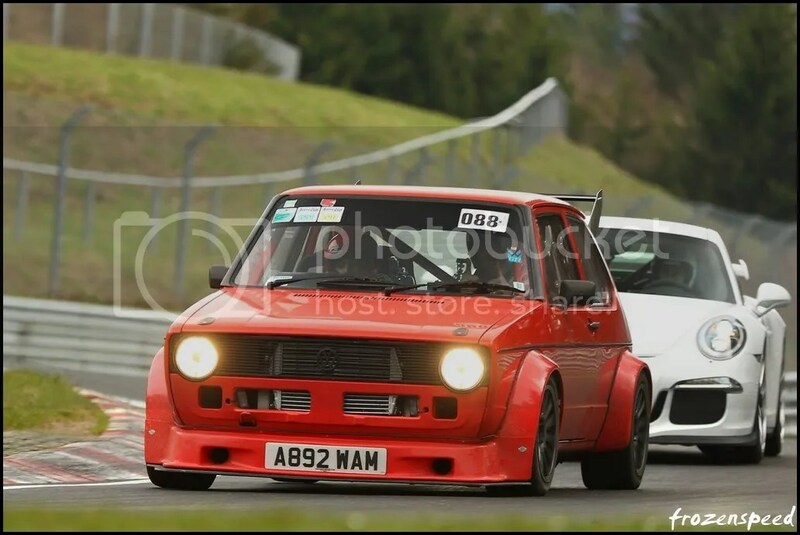 He`s a regular at the ring in this car and can pedal it well so I asked if Matt could jump in with him. “Sure, the first lap will be slow but then we`ll do 3 or 4 at pace”. As I mentioned earlier, I often talk a lot on my videos so I made sure I kept quiet this time. What a cracking lap it was too. The car felt brutal yet driveable. A strange way to describe it but I can`t think of any other way to convey just how intense it was. The acceleration and grip was astonishing. 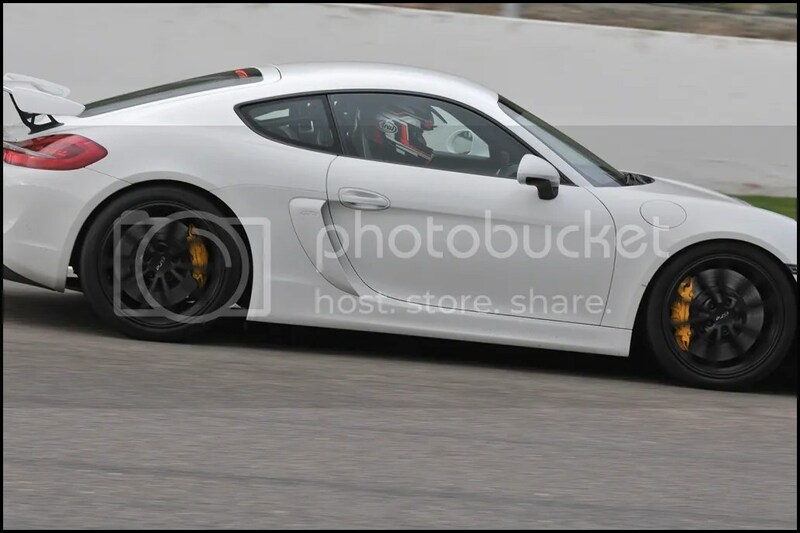 Being used to a FWD car I was constantly impressed with how soon he could get on the power. 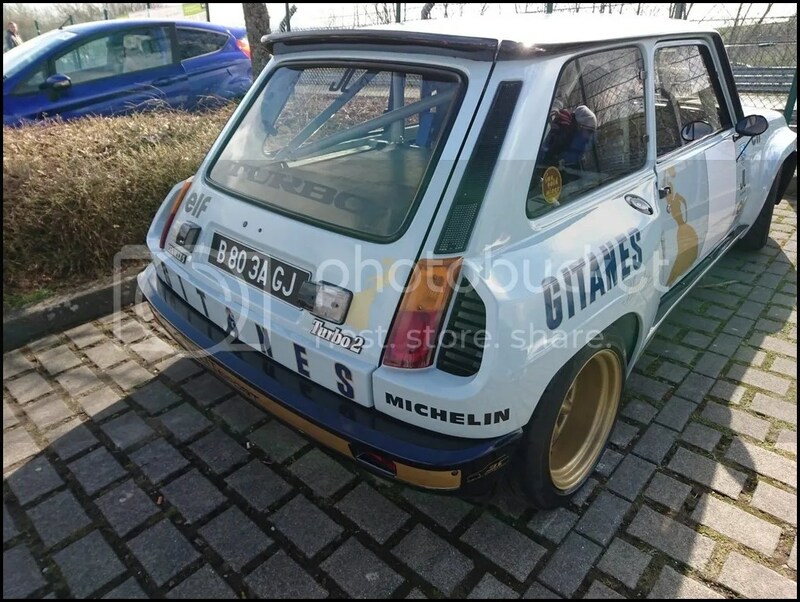 I know he`d spent a lot of time removing the understeer but it certainly showed. We had a talk afterwards and I asked why he didn`t use all the track in a couple of places “I knew you`d say that ! I know I`m not doing but it`s too late by the time I remember” was his immediate reply. I also made a point of noting how his Turbo spooled after a gearchange. It was better than mine and confirmed what Eric has said about mine being a little laggy on upshifts. Looking at the datalogs afterwards and the ECU enrichment is causing the AFR to go rich for half a second after a gearchange and that`s blunting the performance. It`s something I can tweak to remove. Ram had been patiently waiting for Gurds to return. When he saw him coming back into the carpark he went over and claimed the passenger seat. 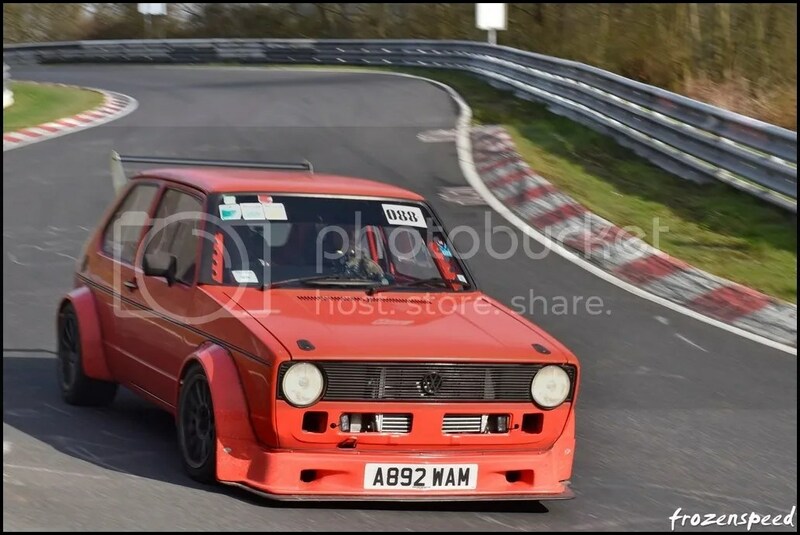 It was time for Gurds to take Ram out for his first ever ring lap ! Gurds finished the lap, came back in to check everything was OK. Just look at that empty track. No other car in sight ! He went straight back out and started pressing on a lot more when the Red flag came out. It was a shame as when he looked back, the data showed the car had the pace to be over 30 seconds quicker than the lap above but unfortunately the stoppage meant he couldn`t complete it. Whilst a little irritating, it`s only a `time` and the actual lapping was the thing that mattered. Ram was buzzing afterwards, it was all he imagined and more. We couldn`t shut him up when he came in. The thoughts of a first timer is something I always enjoy hearing. Their enthusiasm and excitement is infectious and Ram made sure we all knew how much he`d enjoyed the laps ! The red flags were out but Matt wasn`t in the carpark. I looked but couldn`t find him. Then was told the stoppage was a Silver M3. 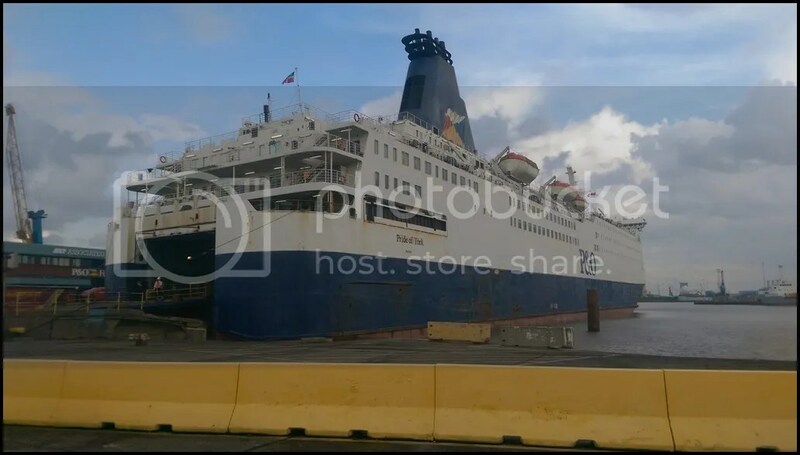 That`s not a nice thing to hear but fortunately I was told it was just a mechanical issue. 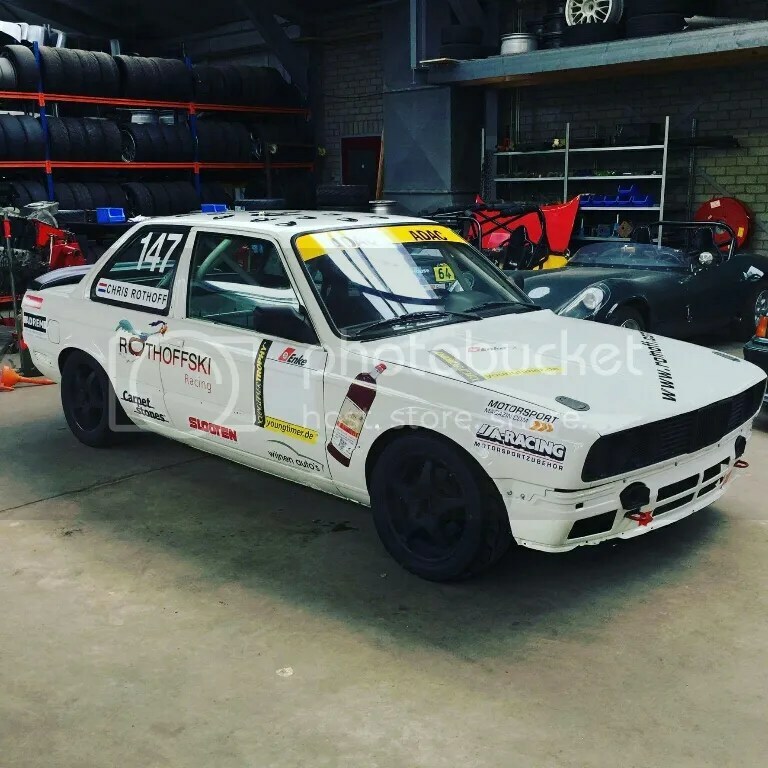 Chris`s M3 is a well prepared car, it laps the ring regularly and has been racing whilst the E30 was built. 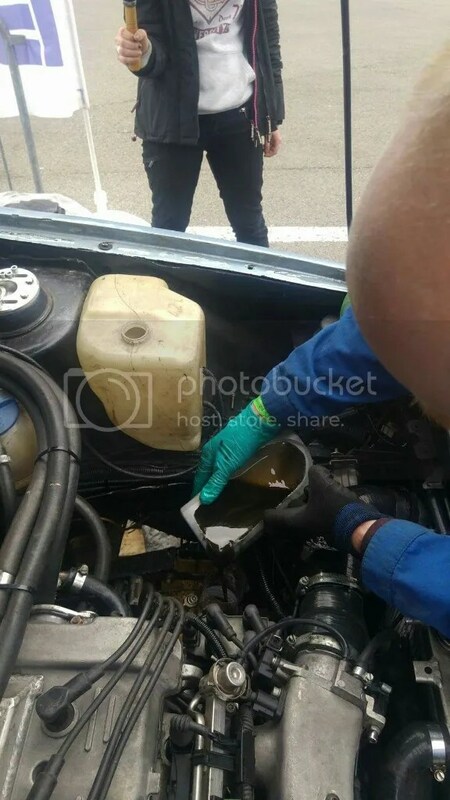 Unfortunately a hardpipe to the oilcooler failed going down Dottinger Hohe, dumping most of the sump contents on the track and quite a bit on the back of the car. The marshalls immediately started flagging and all the cars behind were able to slow down and nobody went off. Rather different to some of the oil spills I`ve encountered in TF where the first you know about it is when you can`t stop and there are cars all over the road ahead. I stopped doing TF years ago when the UK insurance became too risky. This is the reason why. A mechanical failure could have caused untold incidents on a TF day and the insurance claims from anyone crashing on the oil could have been painful. Even more so if they were injured. Trackdays like this might not be cheap when looked at in isolation, but once you factor in the reduced numbers, as much lapping as you can manage and marshalling for things like this they suddenly look much more attractive. The oil spill meant the day finished a little early and it was time to packup. Karan removed his splitter ready for loading onto the trailer whilst the rest of us spent the time reliving the laps of the trip. 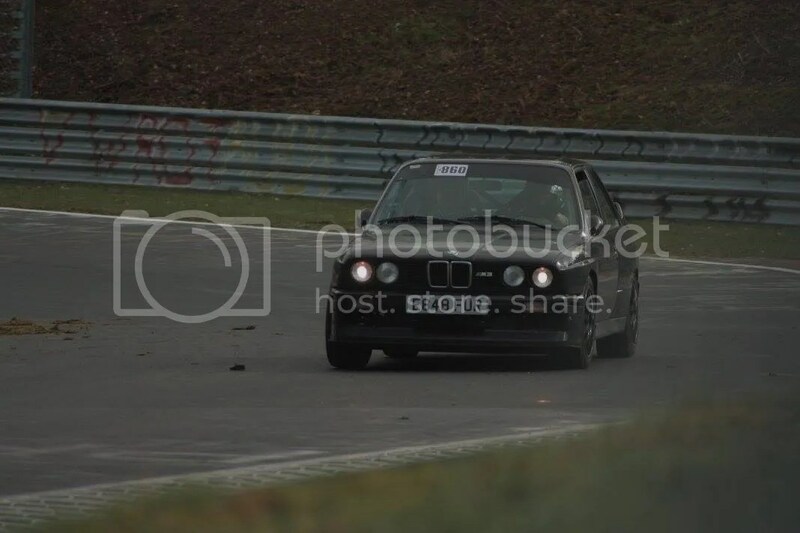 After what felt like a long day I knew I`d missed out on some top notch tracktime. It was a bittersweet feeling and not one I want to repeat anytime soon. I think it was only a little after 11 when we left. Far earlier than usual but we were all shattered. 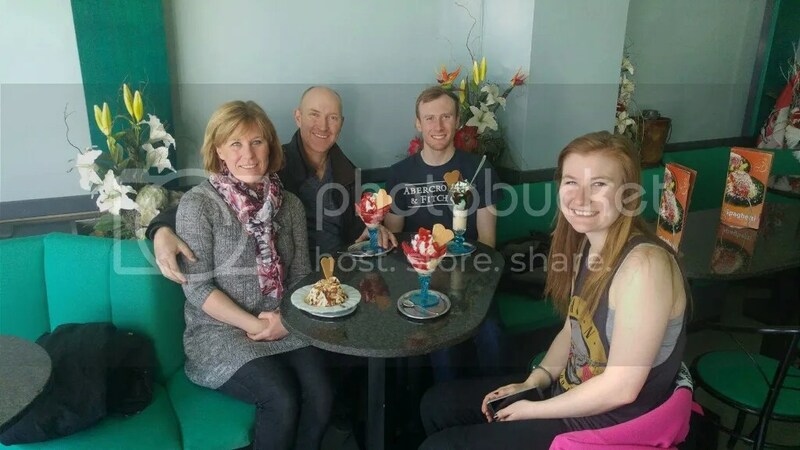 Saturday morning and we popped down to the Eis Cafe for the now obligatory Icecreams. The owner knows us now and always talks to us in English as soon as we walk through the door. 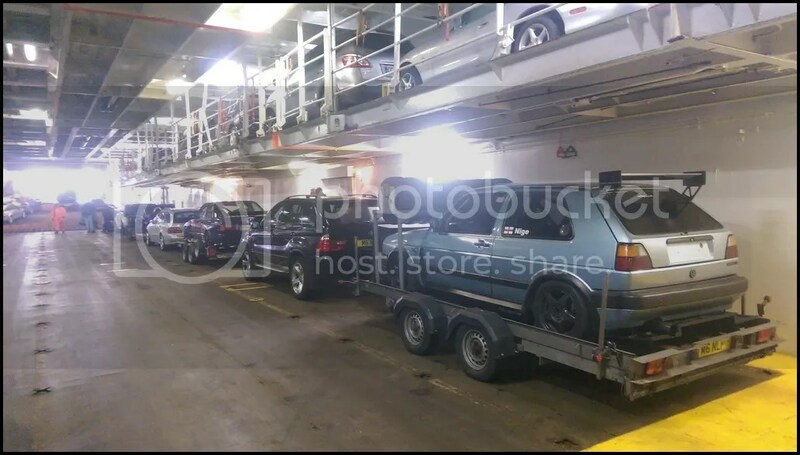 A very steady drive back to the Ferry on Saturday morning after I`d phoned up and added the trailer. The plan had been to leave it out there for my next trackday but obviously it needed to come back home for investigation..
Met up with Ed and Nakita on the way back where we shared a meal and stories about the trip. 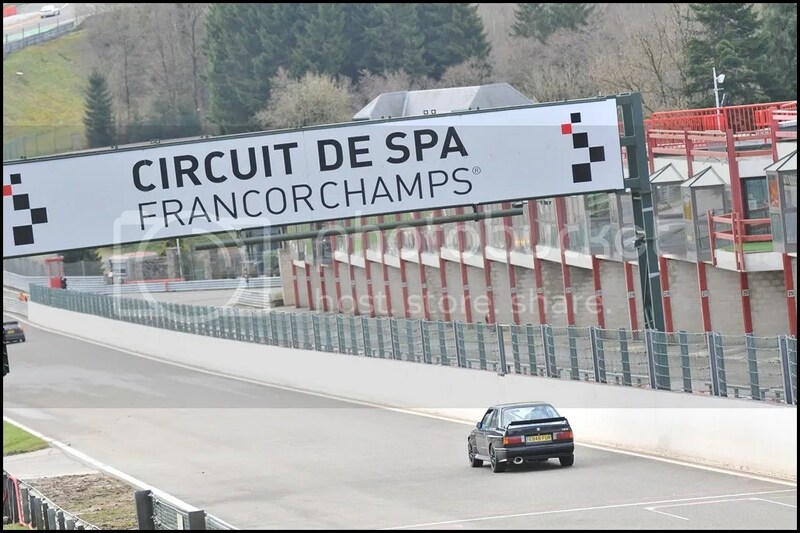 I had plenty time for reflection on the way home and whilst it was a disappointing trip from a reliability point of view, I had 3 thoroughly enjoyable days with good friends at Spa and the Ring. Spa was frustrating with the little issues but when I did lap the Golf was all I could hope for. The Ring was a big let down, not a single driven lap and near perfect track conditions. We arrived home just before lunch on Sunday, by Sunday evening I`d removed the engine and confirmed the trigger wheel had failed. I already had a new crank, A friend sent me a replacement flywheel and another sent my an external trigger wheel incase I needed it. 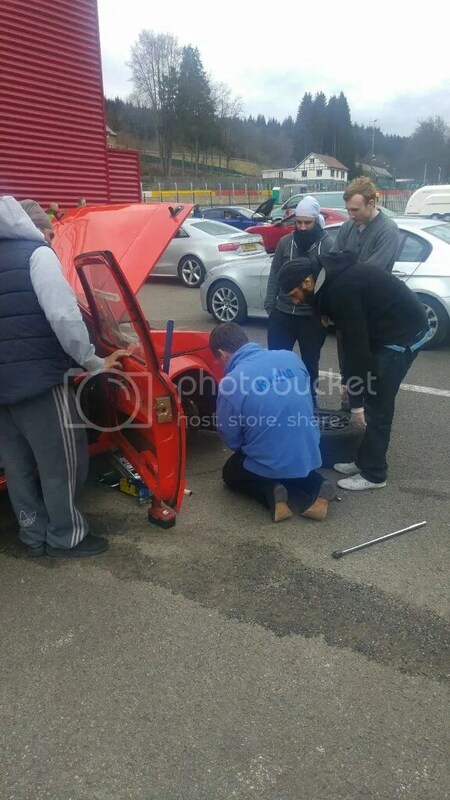 They were in my hands first thing Tuesday morning and I was able to rebuild the engine last week and had a trouble free shakedown at Blyton Park last Saturday. 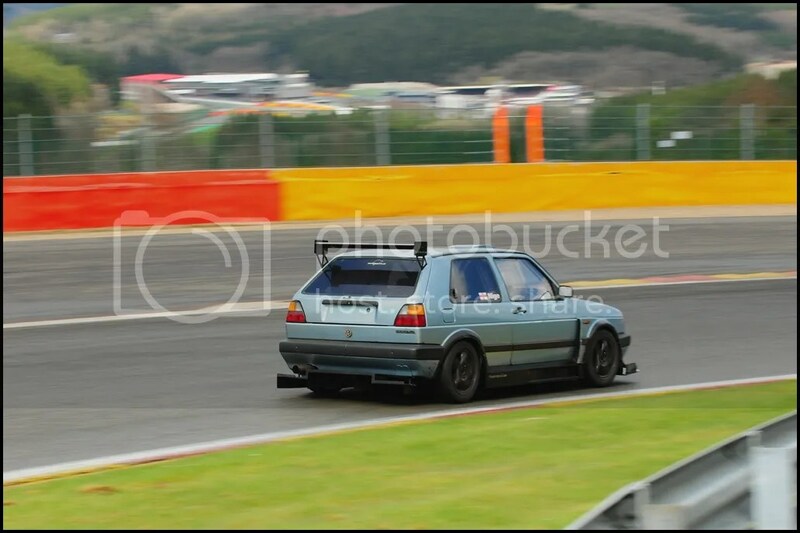 Before I finish off, remember the ECU reset issue I had at Spa ? 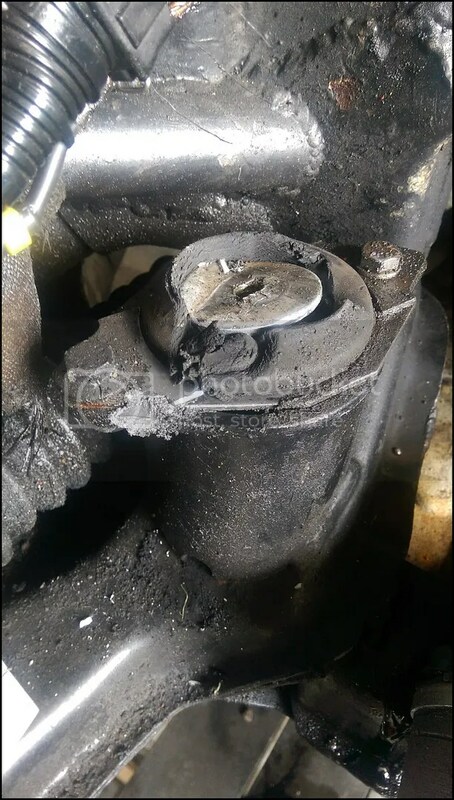 The Gearbox mount had completely collapsed. Nothing major apart from it allowed the engine to drop onto the wiring loom. 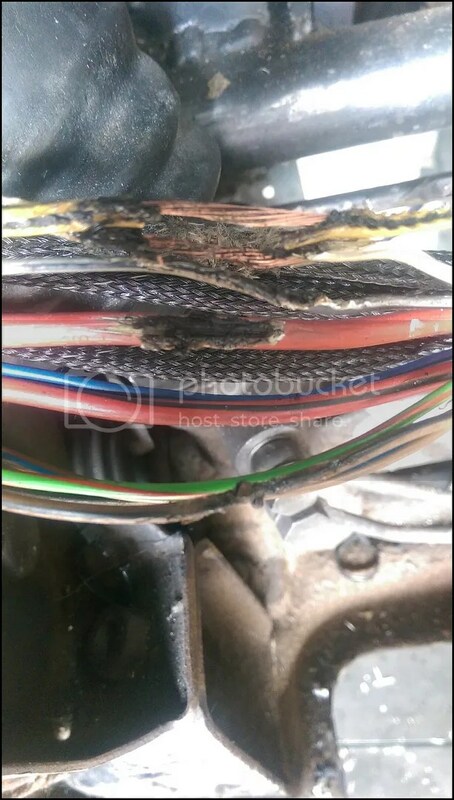 It had burned through the headlight and Main engine bay feed wires. The ECU reset wasn`t my new wiring, but the exhaust manifold earthing the main feed and sending noise back into the loom. I was lucky it didn`t set on fire. New engine mount, wire repair and it`s now running without issue.